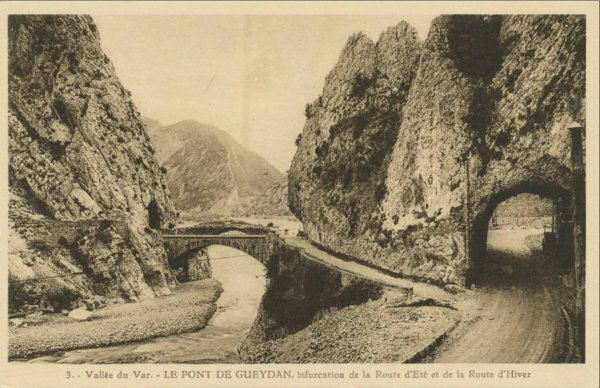 The line from Le Pont de Gueydan north to Guillaumes followed the valley of the River Var and ran through the Gorges de Daluis. 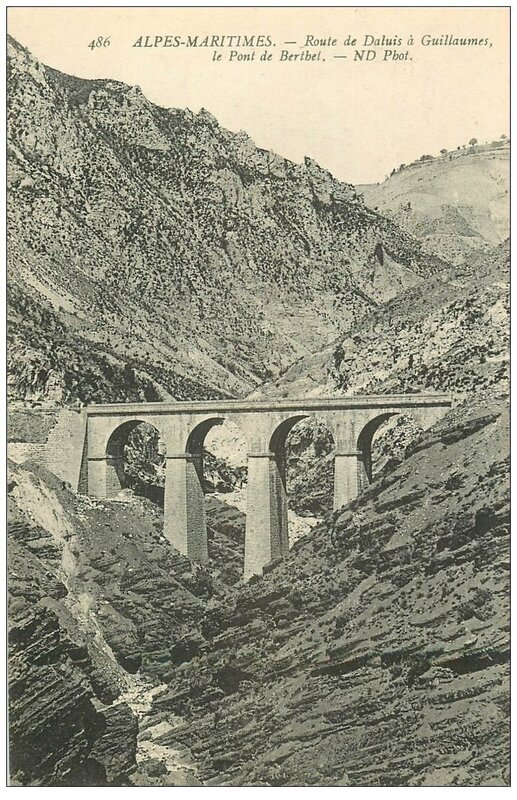 Marc Andre Dubout, writing in French, says that the line was probably the moist daring of secondary line construction work with very steep gradients, numerous tunnels, two remarkable bridges. 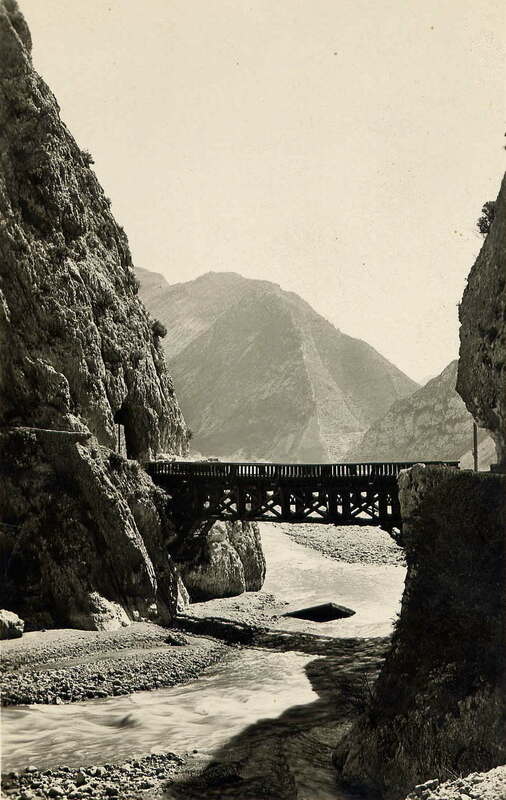 He comments that it is the most impressive tramway from a tourist perspective with ‘unique viewpoints and singular landscapes’. As with a number of these lines, the expenditure was profligate and the value limited. 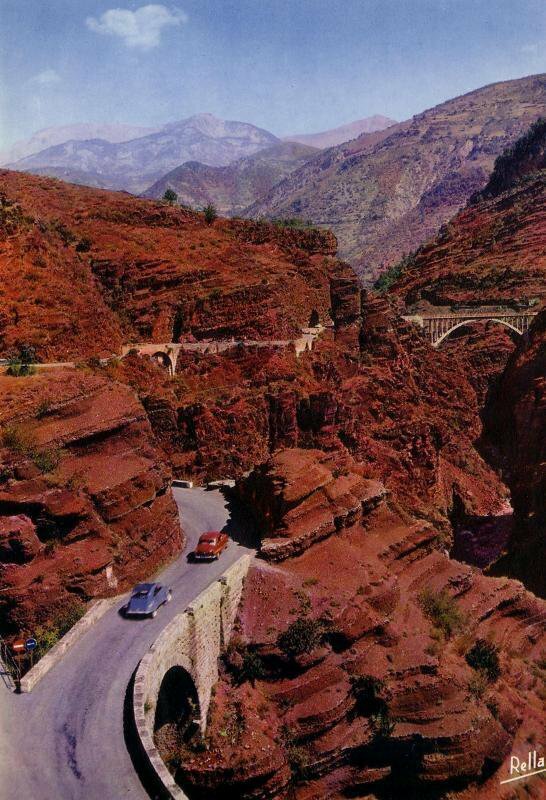 by the time the line was completed road transport was already becoming reliable and more comfortable. The line stood no chance of being profitable. 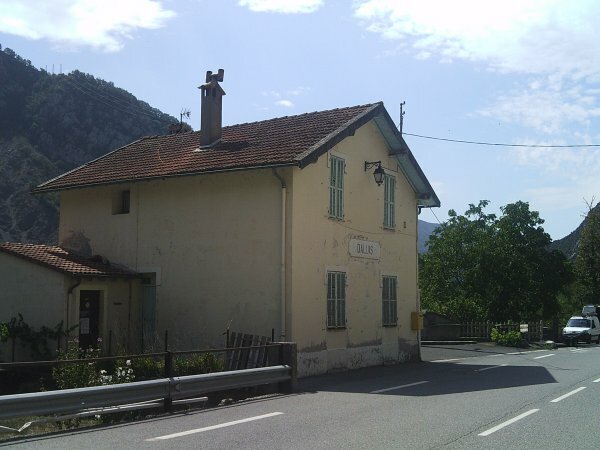 The station at St. Benoit Pont de Gueydan was the junction station for the line north through the Gorges de Daluis. 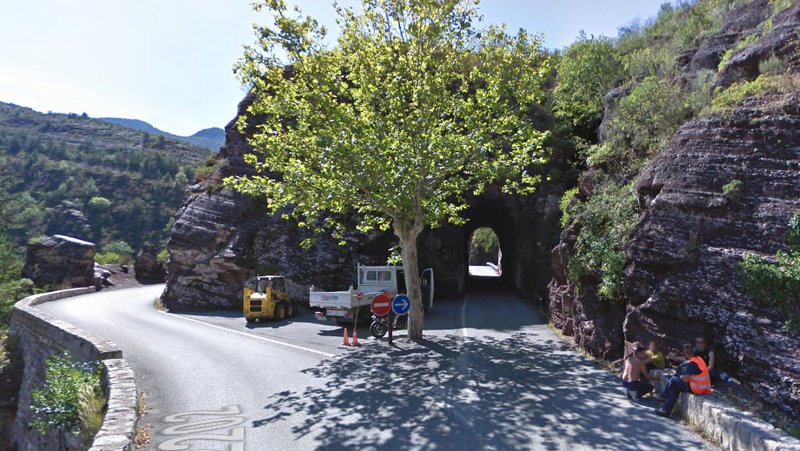 The tramway followed the road round the bluff which faced west across the River Var and entered its first tunnel as it rounded the curve. 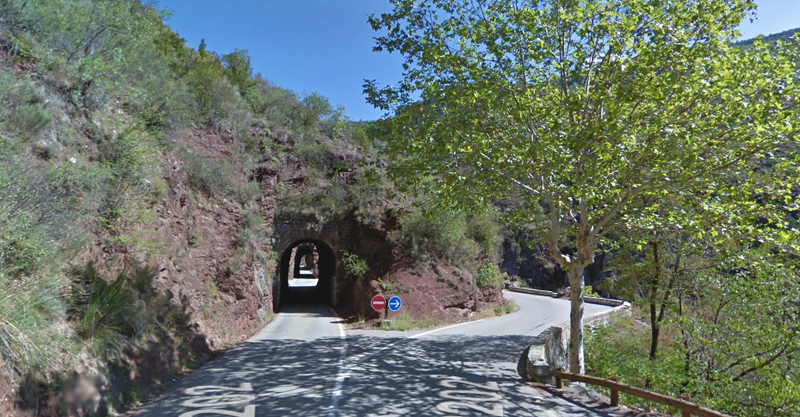 The main road (N202) continues West and the D902 travels north up the valley of the Var using the old tramway tunnel. The south portal. 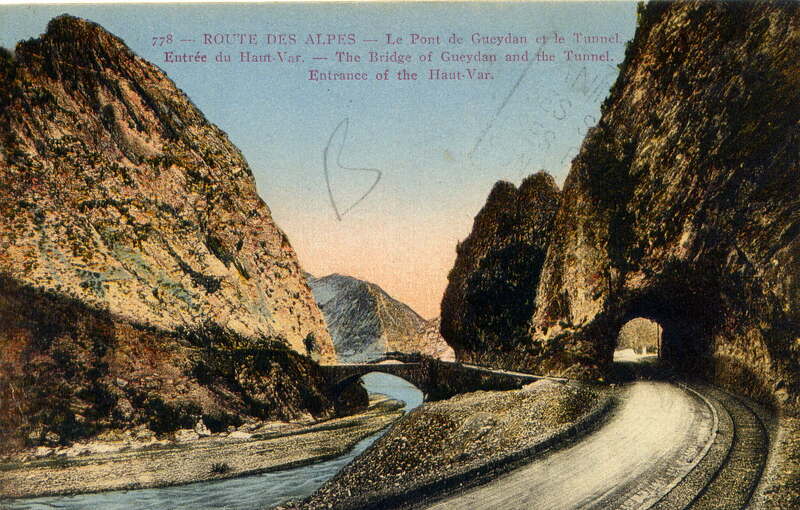 The postcard view (above) of the north portal shows the old bridge on the main road – Le Pont de Gueydan. 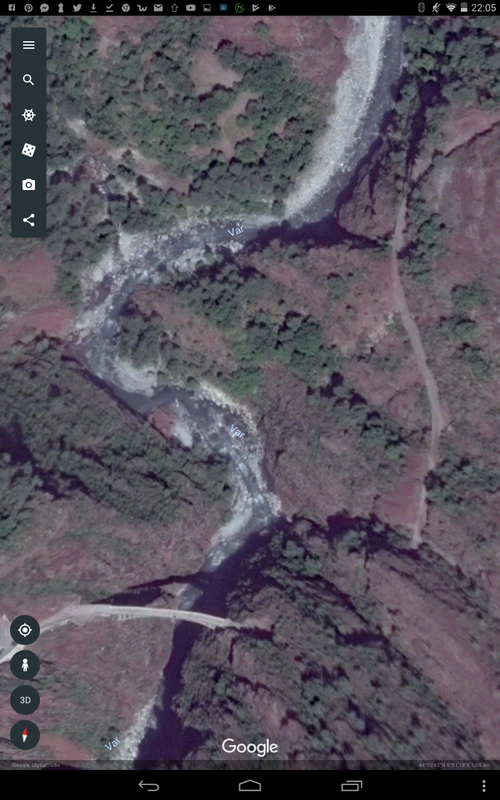 The image below shows the old bridges more clearly. The same bridges from the south side. This image clearly shows the tramway in place. After the old bridges were removed there was a temporary structure in place for a time. This is shown in the adjacent monochrome image. A new structure was planned for the main road and was built in 1949. That new structure is shown in the picture immediately below. The image shows the south side of the bridge. The image below that shows the 1949 structure from the north side. The old bridge abutments are still visible to the north of the 1949 bridge. 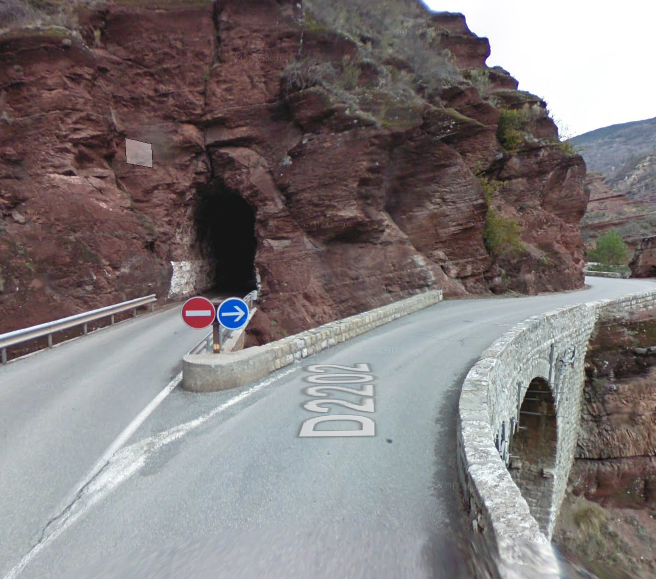 The road tunnel is now disused. 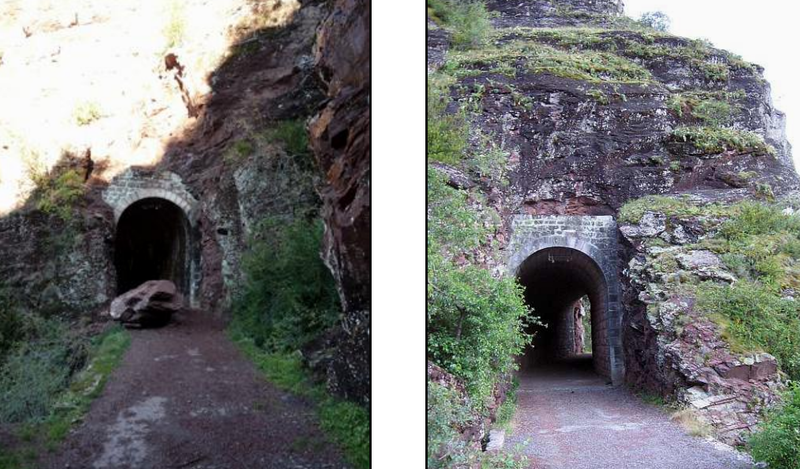 The third image below provides a final image of the tunnel and its north portal. 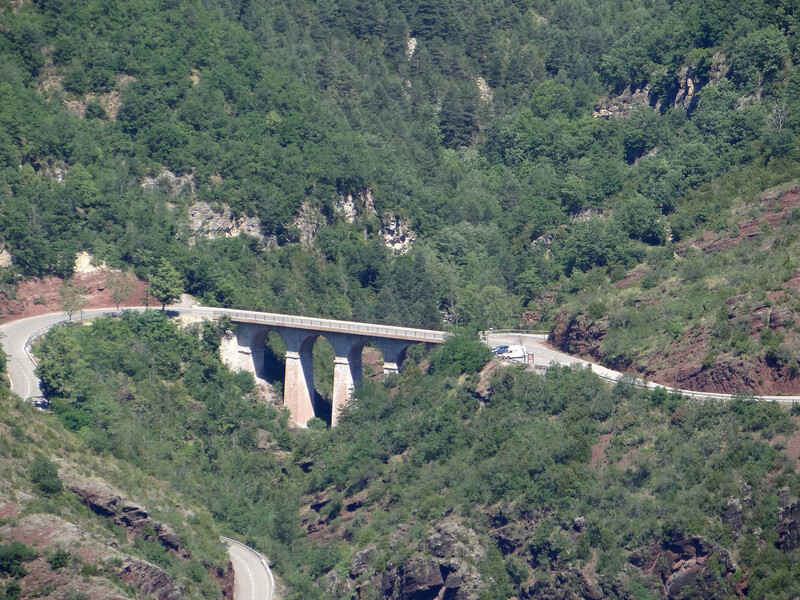 The tramway and road travelled north through the relatively wide valley of the Var heading for Castellet-lès-Saussesm and crossing streams on the way. 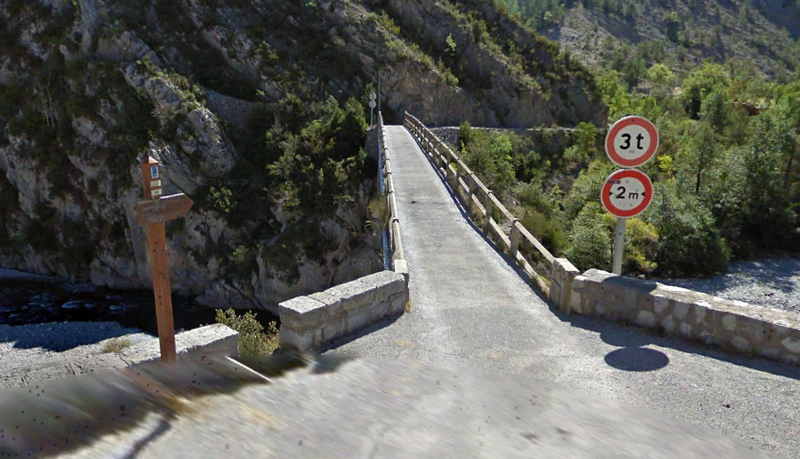 The original bridge over Ravin du Riou was also the location of a stop serving Enriez. 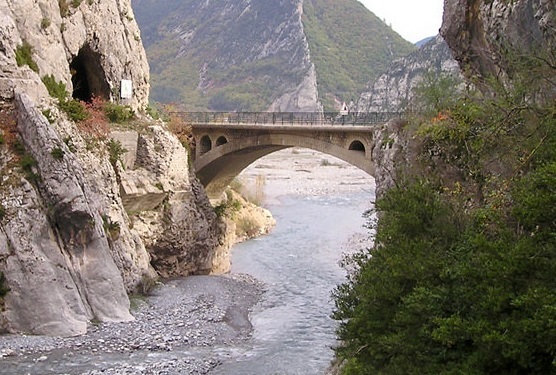 The road/tramway followed the river bank and at times that closeness meant that the track-bed or in later days the road were disturbed by flood flows in the river. 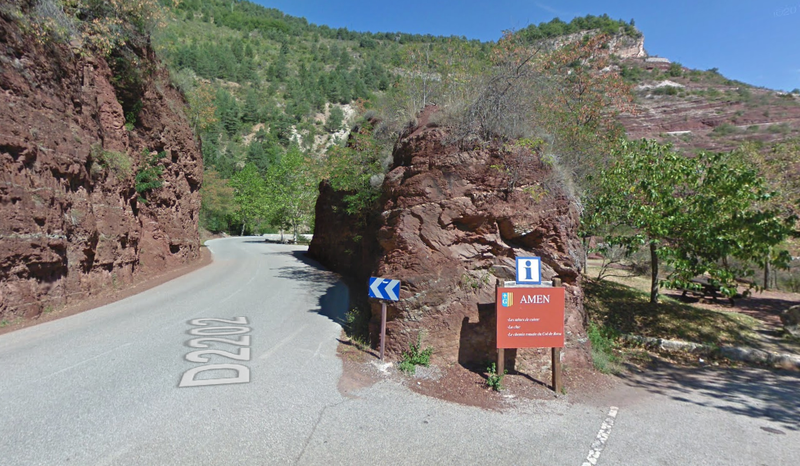 The road ran below the villages of Castellet-lès-Sausses and Sausses with the next station being at the bottom of the road from Sausses, adjacent to another Ravin du Riou. 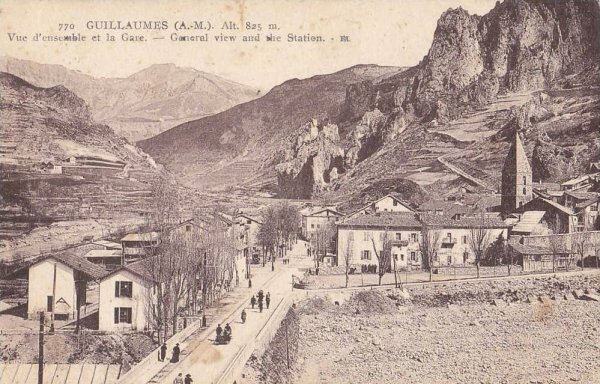 The tramway continued up the valley, tightly following the river. 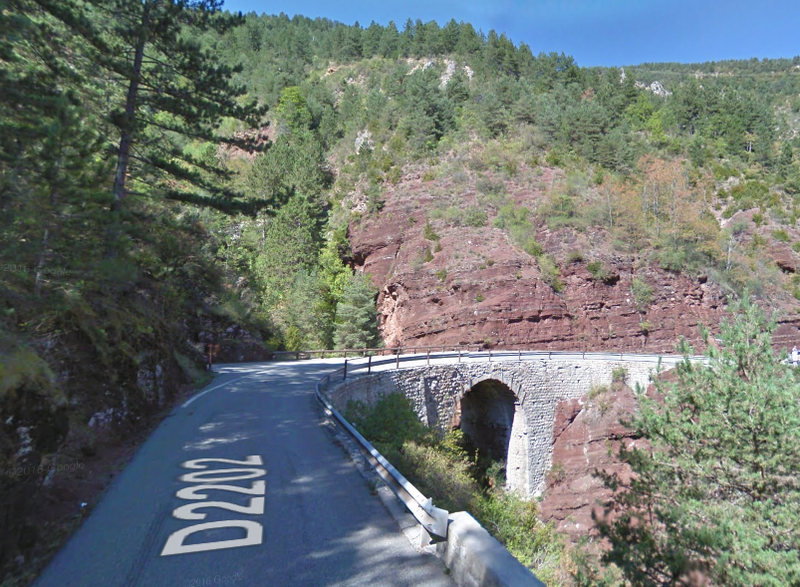 The departmental boundary sees the road number change from D902 to D2202 and we soon encounter a bridge over the Var, not for the tramway but for the D316. It is an elegant concrete arch with a cpacity of only 3 tonnes. 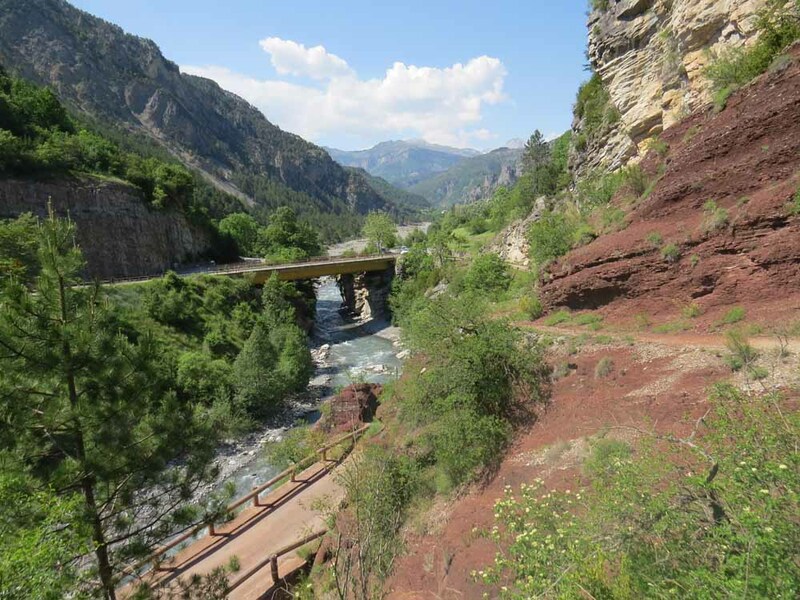 After Daluis, the tramway climbed steadily above the river and at the Vallon de Berthéon turned away from the Var to negotiate the tributary, seeking to avoid a much longer viaduct that was required higher up the valley. 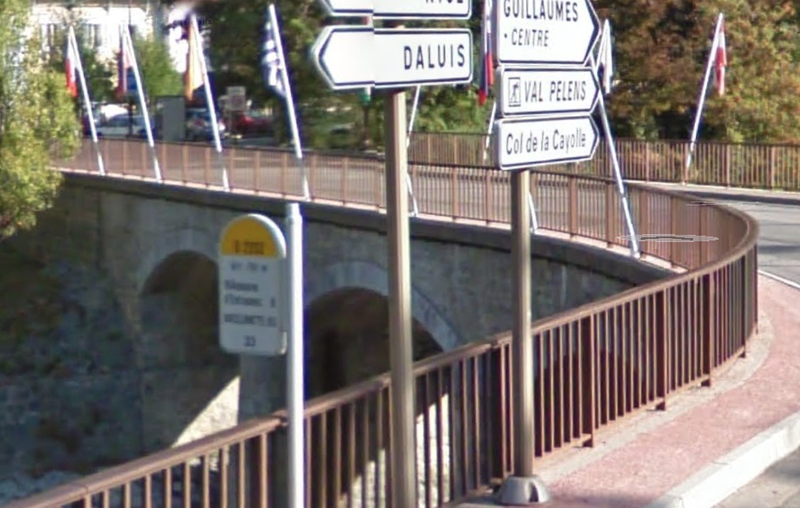 The Pont de Berthéou was the compromise position. 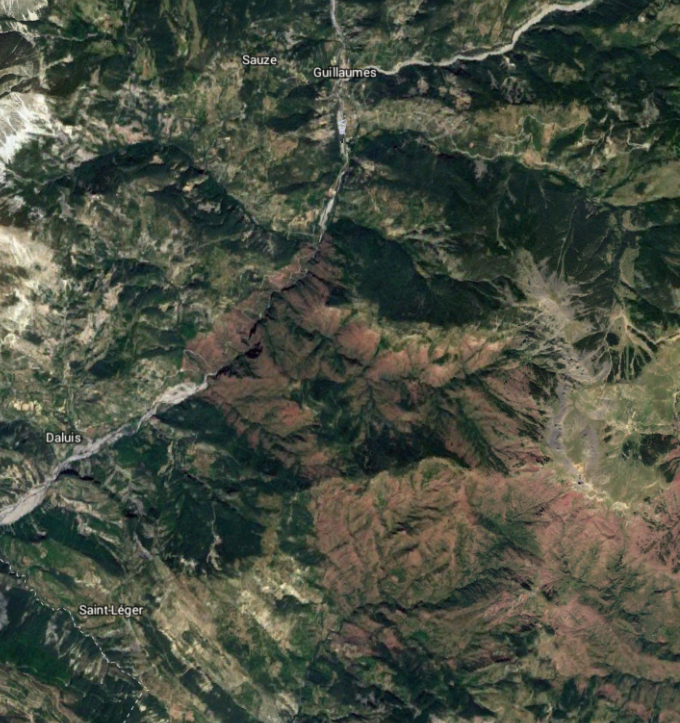 The detour is shown on the satellite image below. The Pont de Berthéou is in the top left of the image, the River Var, at the bottom right. 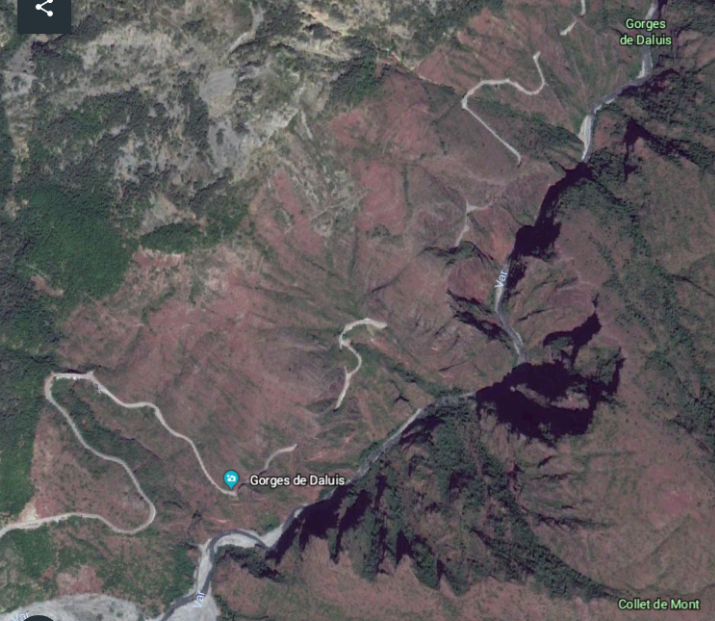 The picture immediately below the satellite image shows the road/tramway formation just before entering the Gorges de Daluis, clearly a significant height above the valley floor. 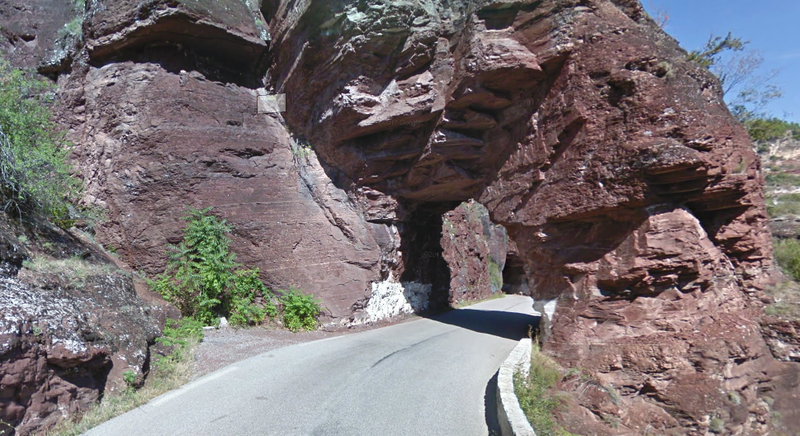 The rock formations alongside the tramway/road have changed significantly in appearance. 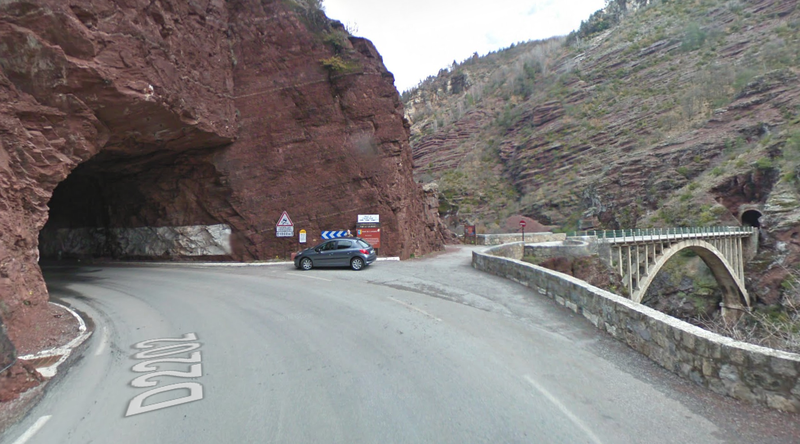 The Gorge de Daluis is , as we have already noted, in an area of red sandstone. 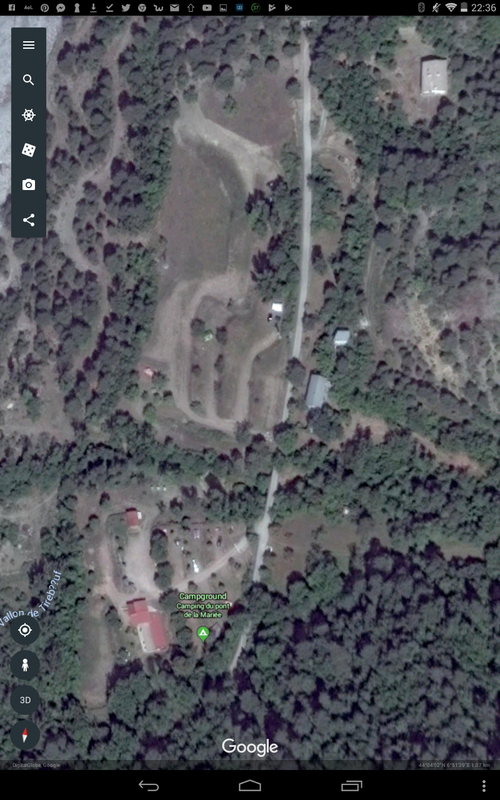 The satellite image below sows that this is a very discrete area. 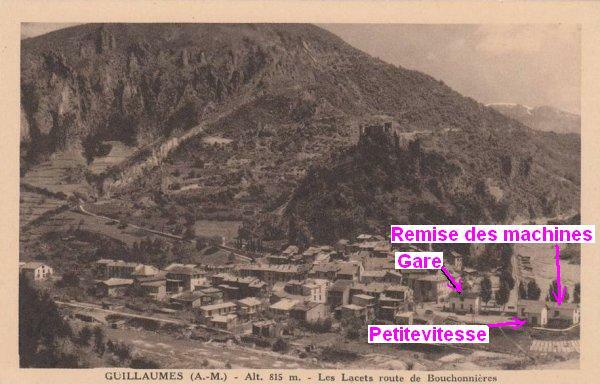 Both Daluis and Guillaumes are shwn on the image and it is just possible to pick out the Vallon de Berthéon on the western edge of the red sanstone to the Northeast of Daluis. 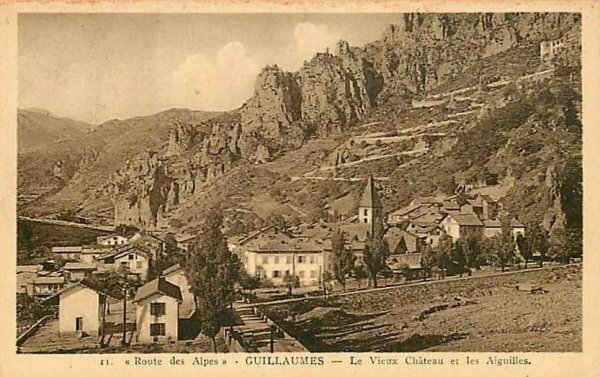 The commune of Guillaumes has produced information about this distinctive area. 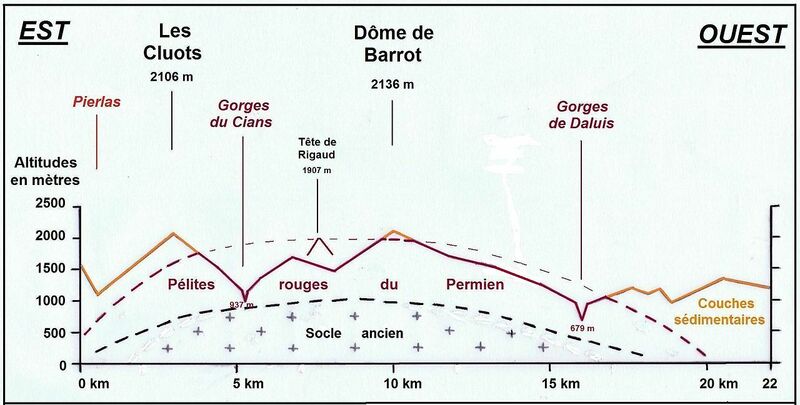 Tourist brochures , are supplemented by detailed geological information. .
At the end of the Paleozoic Era, about 250 million years ago, following the erosion of a Hercynian crystalline massif, now extinct, clay sediments, quartz, mica flakes, minerals rich in iron and volcanic ash settled on the site of the dome of Barrot which was then a floodplain. As they accumulated, these sediments were sunk into a collapsing basin (a graben in distension, named the Argentera-Barrot basin) where pressure and heat turned them into rocks called pelites. 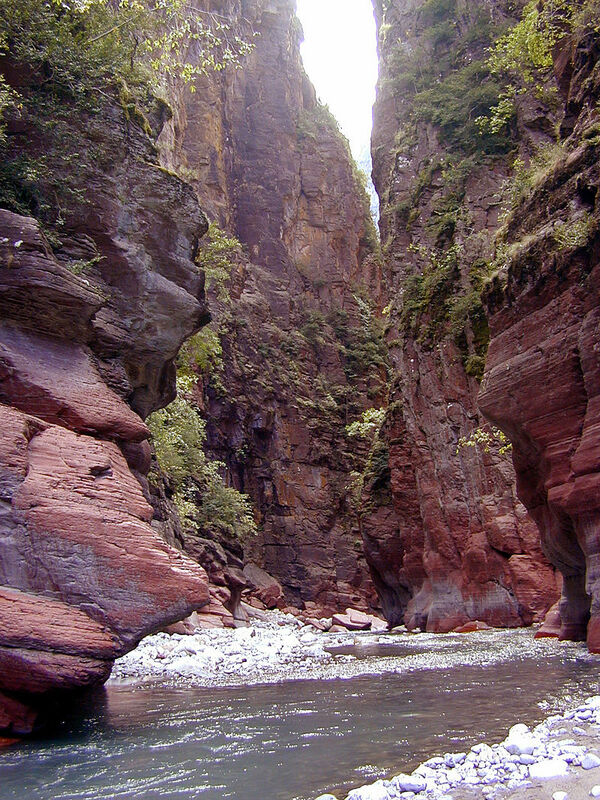 The hot and humid climate of the time caused the oxidation of the iron, which coloured the sediments red. 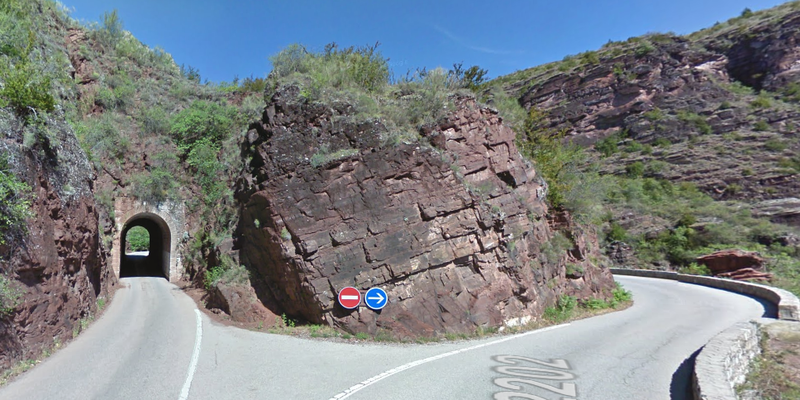 In the Mesozoic Era, the sea settled on this pelitic base rock and new sediments were deposited from a massif located in the current Mediterranean. Over tme, these new sediments produced limestones, gray marl and sandstone. The scenery is dramatic! 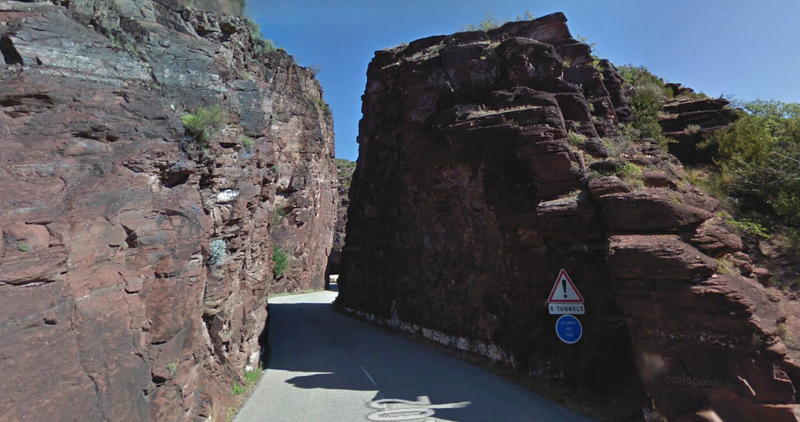 At certain points along its length the tramway/ road clung to the rockface. 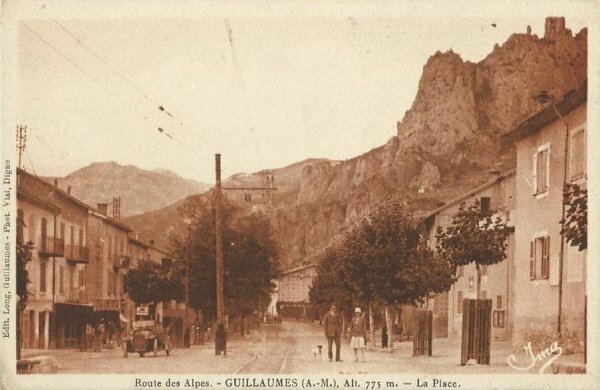 Subsequently, when secondary railways were being built, the town of Guillaumes lobbied for a railway. 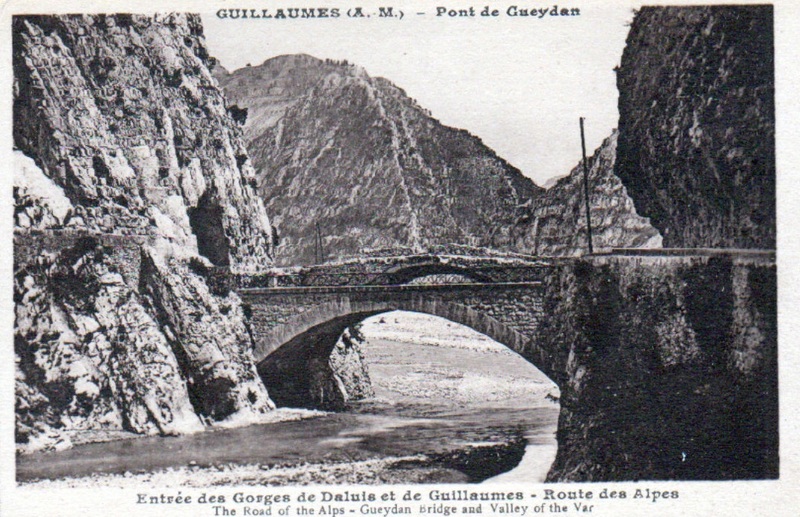 But the nature of the terrain would only permit the construction of a tramway between Pont de Gueydan and Guillaumes. 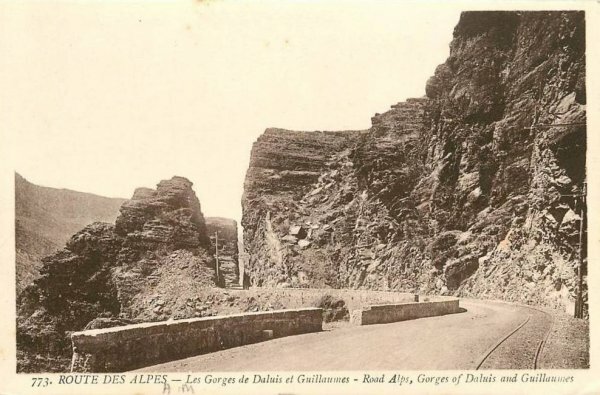 It was only north of the Gorges de Daluis, before arriving at Guillaumes, where the valley became wider, that the tramline was free to choose its own route. That section contains the last four tunnels on the line. The north portal of Tunnel No. 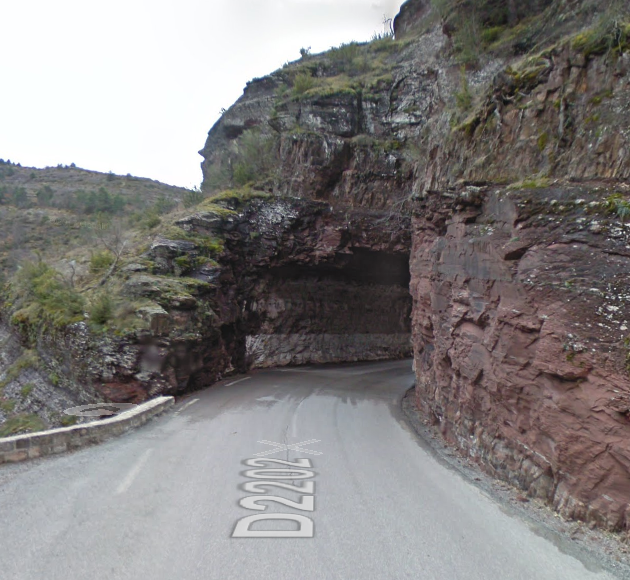 3 is immediately followed by an arch bridge carrying the road  and a couple of significant retaining walls before Tunnel No. 4 is reached. Tunnel No. 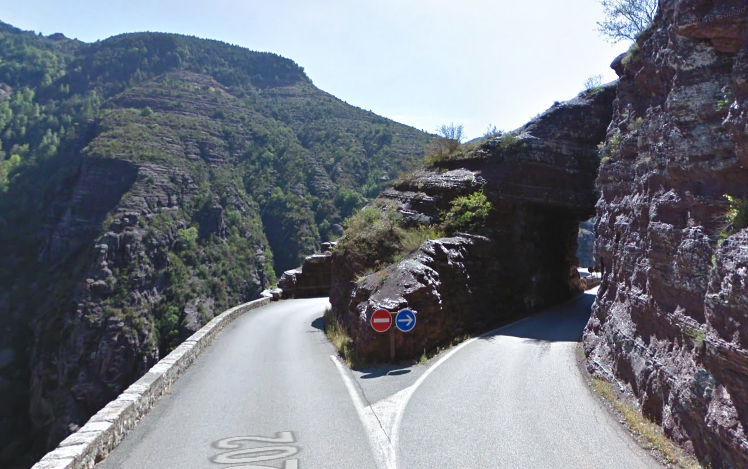 4 was built for the tramway, and again avoided a sharp bend on the road. 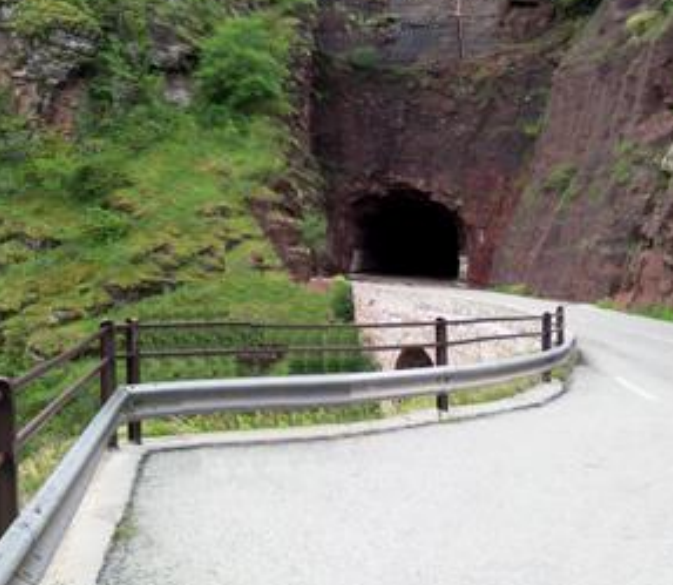 It was a straight tunnel of 241 metres in length. 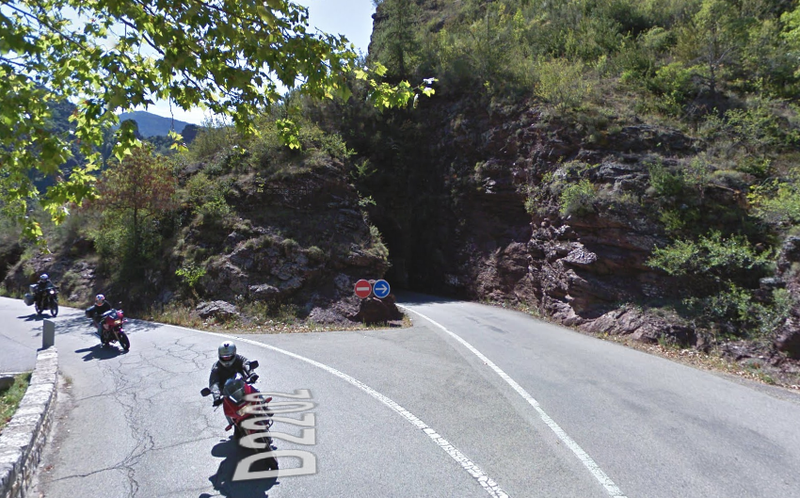 The picture above shows the south portal and the road curving away to the right. 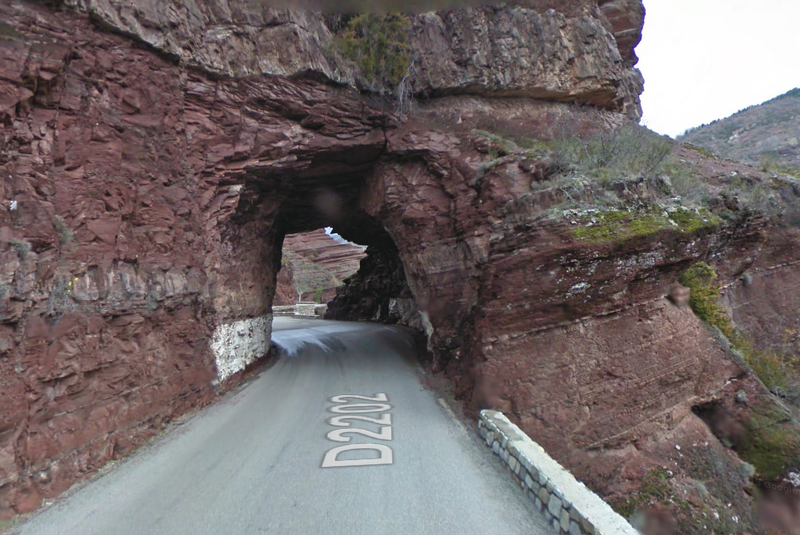 As can be seen on the map below the road entered a tunnel just off shot on the picture above. Tunnel No. 4 is marked with green, blue and red dots on the plan above. 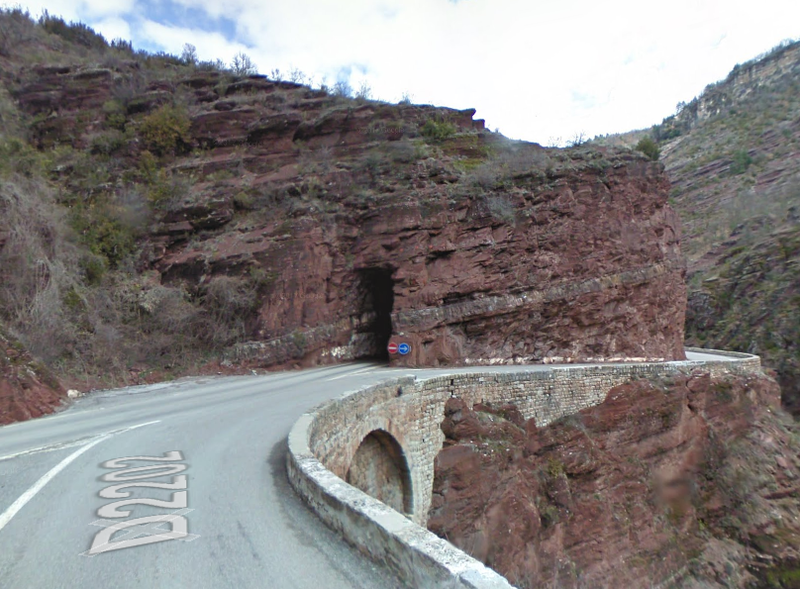 Immediately to the north of the tunnel, the road/tramway crossed another arch bridge. Looking back at the north portal of Tunnel No. 4 from the arch bridge above. 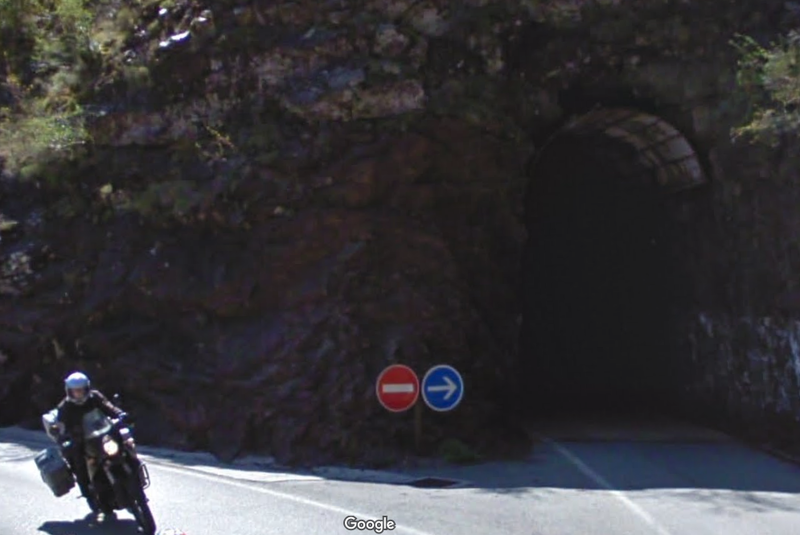 In a very short distance we encounter Tunnel No. 5 (above), this was built for the tramway as was 69 metres long. 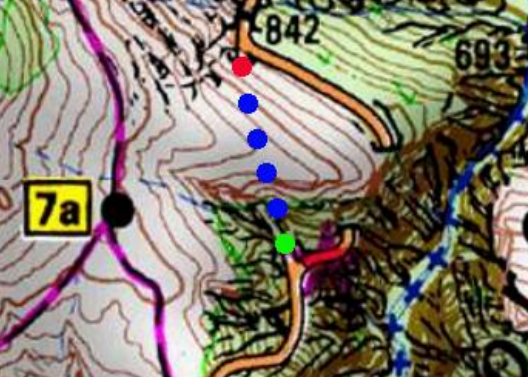 It is marked on the plan below with a green, blue and red dot. 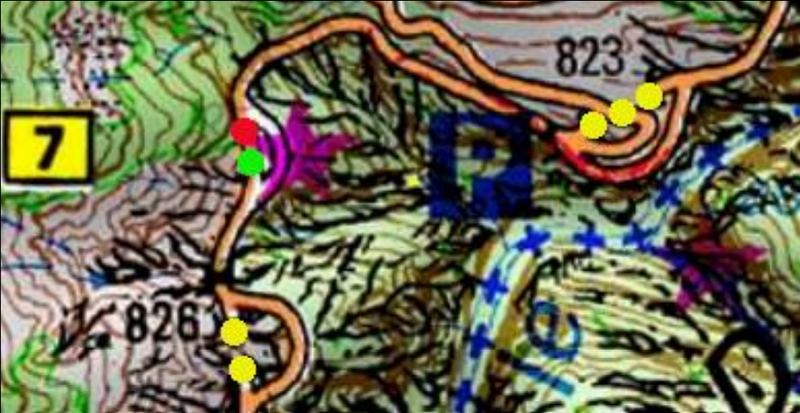 The yellow dots represent Tunnel No. 6. Tunnel No. 5, north portal. Tunnel No. 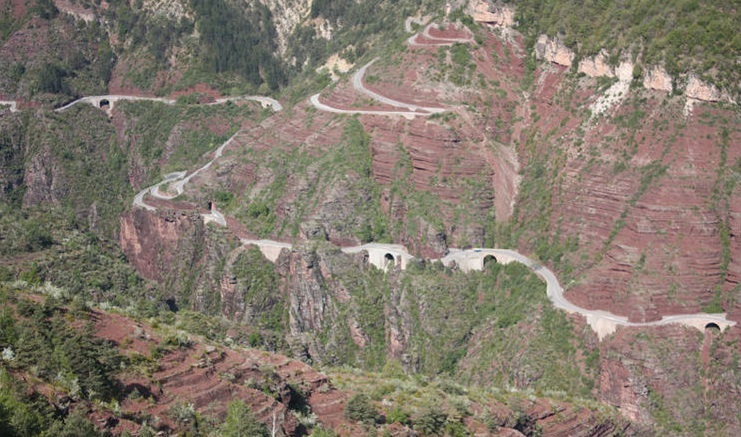 6 is encountered immediately, it was originally built for the road, although at the time of its construction the road was much narrower than at present. The shot immediately below shows the old arch bridge over the stream which was directly before the tunnel entrance and clearly shows the modern widening of the bridge. 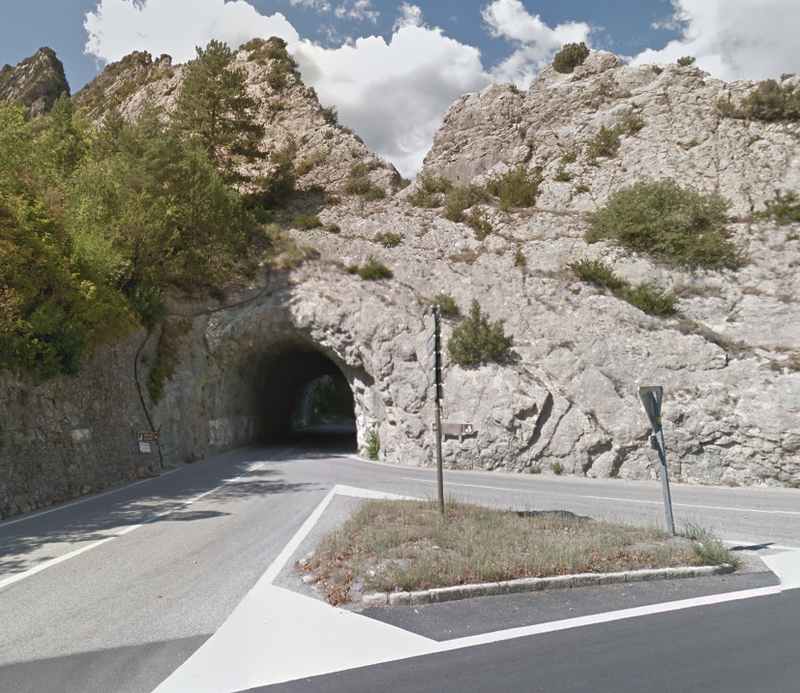 The south portal of Tunnel No. 6 The north portal of Tunnel No. 6 demonstrates the asymmetrical shape of the tunnels after conversion for the trams. The higher side allowed for the catenary and poles which supplied electrical power to the trams. 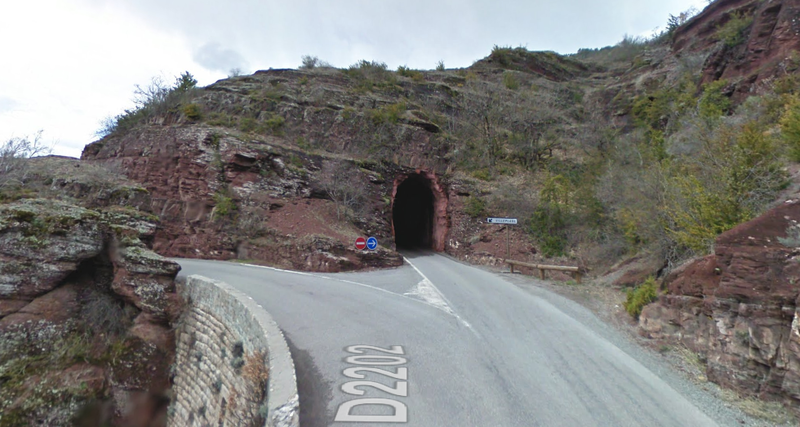 The south portal of Tunnel No. 7, which only about 15m in length. 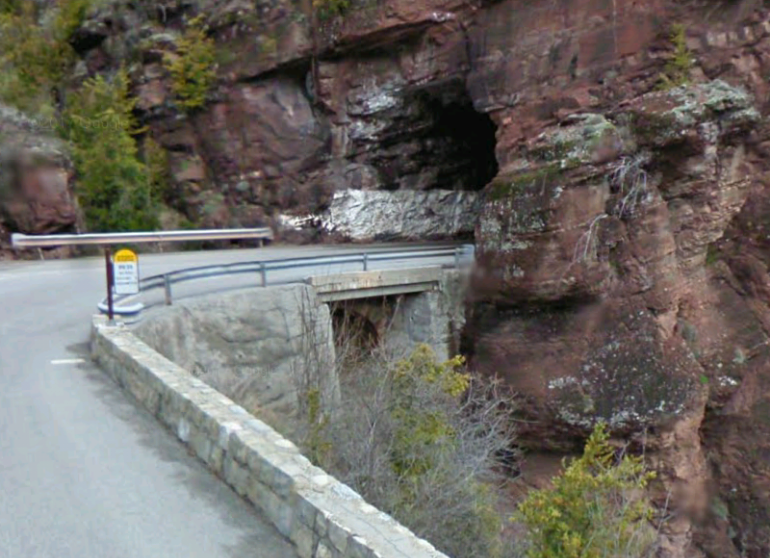 The road curves sharply to the left beyond the tunnel and the picture below looks back at the rock wall from round the corner. Tunnel No. 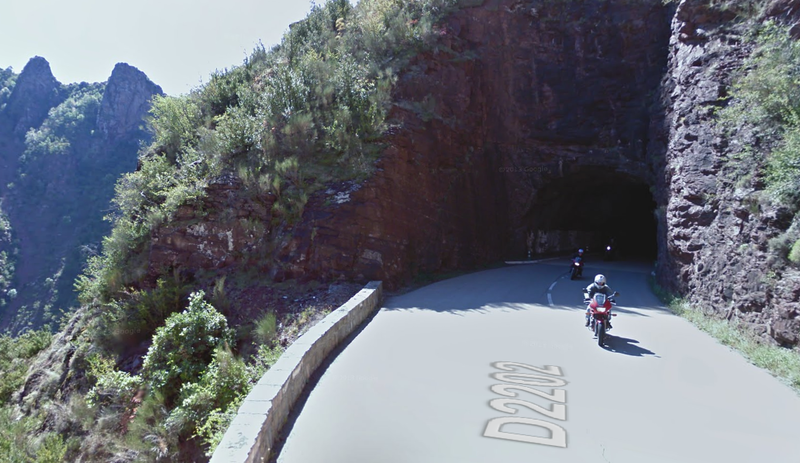 8 is another very short tunnel, encountered within 10s of metres of Tunnel No. 7. It also is very short, no more than 10 metres in length. The first image below shows the south elevation in the 21st Century, and the second shows the same elevation while the tram tracks and catenary were still in place. The north elevation of Tunnel No. 8 in the 21st Century. Tunnel No. 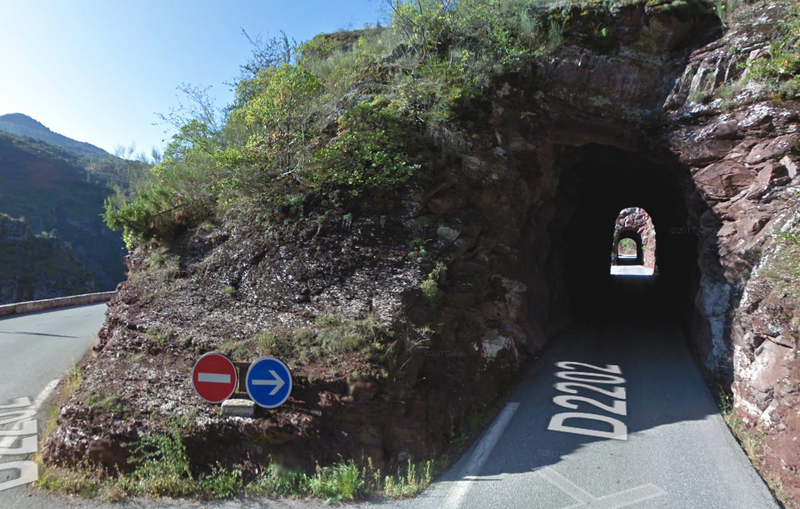 9 is a longer tunnel (43m). 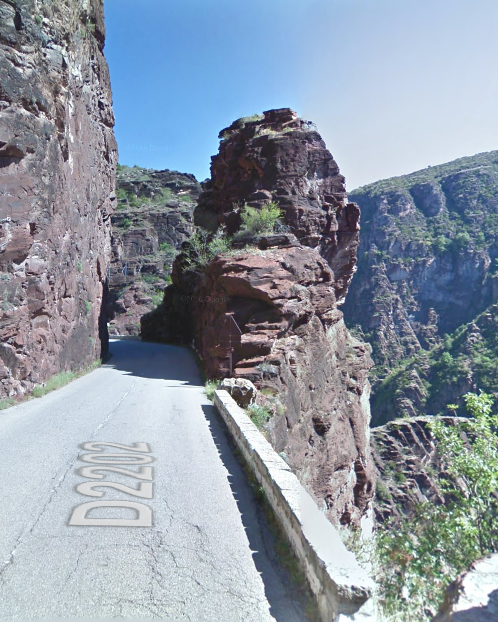 It was built for the tramway, as the road heads out round another rocky promontory. Tunnel No. 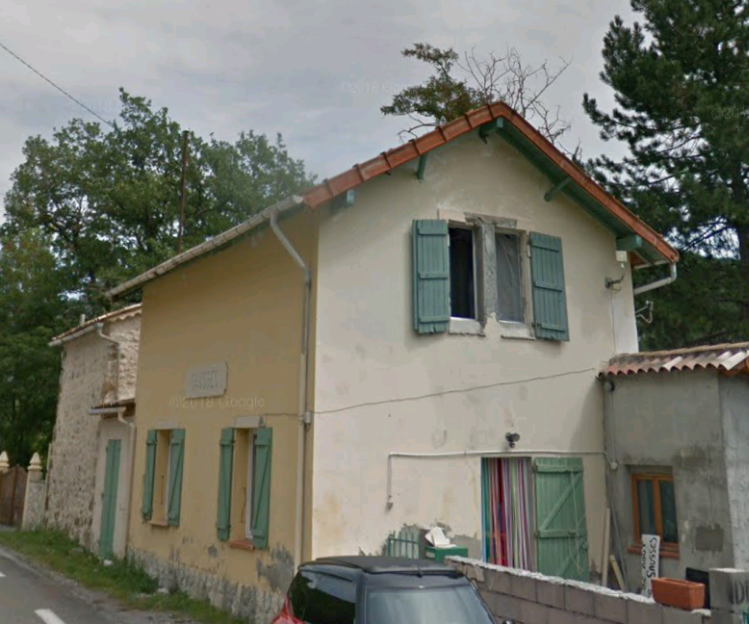 9 South elevation. Tunnel No. 9 North elevation. 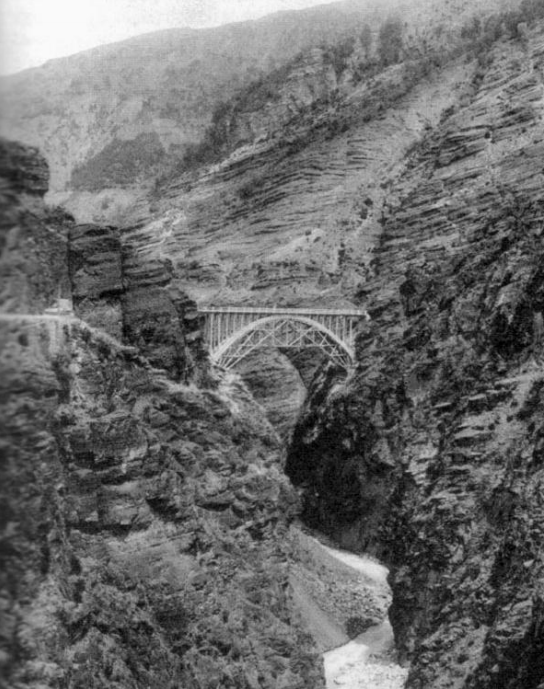 The bridge over the Ravine immediately after Tunnel No. 9. This next map shows the locations of Tunnels Nos. 9, 10 and 11. Tunnel No. 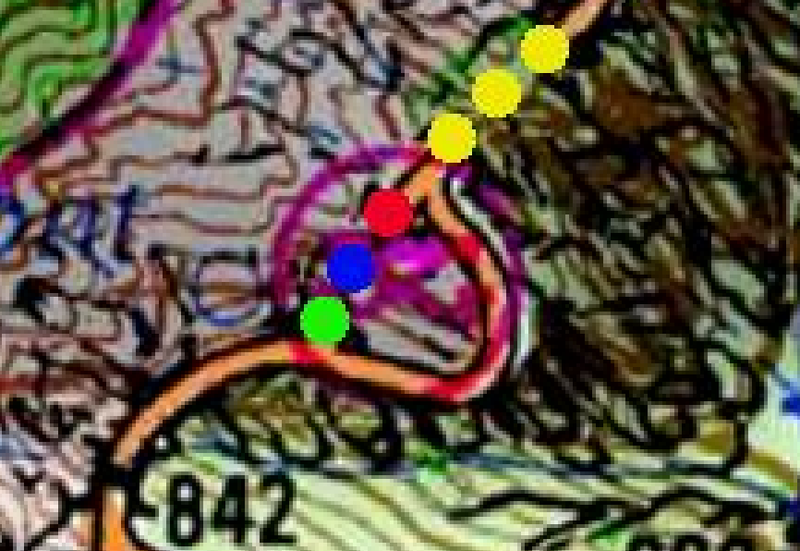 9 is marked with yellow dots at the bottom of the map; Tunnel No. 10 is marked with a read and a green dot; Tunnel No. 11 runs is a more southwest to north east direction close to the top of the map. Tunnel No. 10 was just 22m in length but was, like Nos. 9 and 11, built for the tramway. 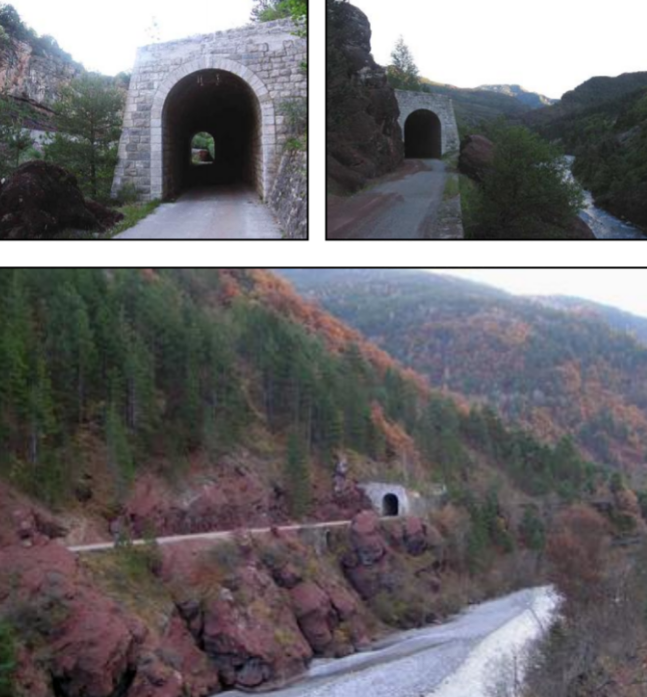 The tunnel roof has been removed and the road diverted along the line of the tunnel. 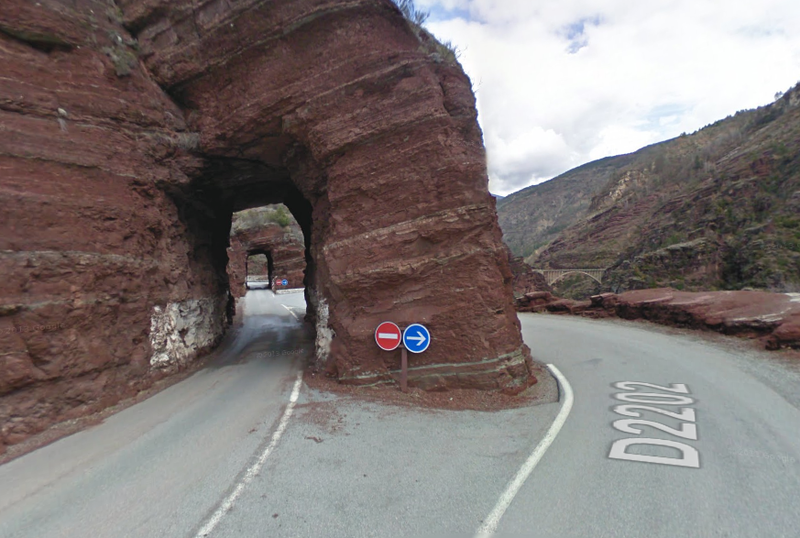 Tunnels and bridges alternate along this route with frightening regularity! This structure is between Tunnels Nos 10 and 11. 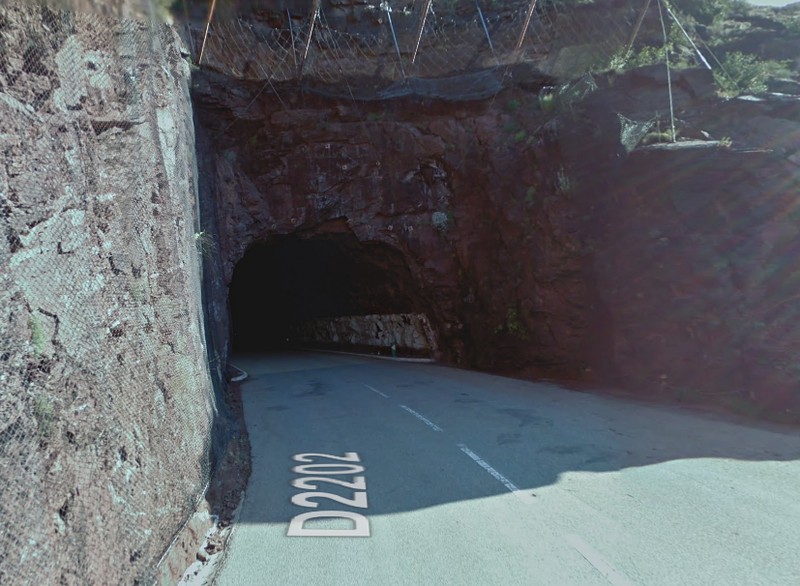 This ‘interesting’ three-way junction heralds Tunnel No. 11. It appears very narrow but was built wide enough to accommodate the 1.9 metre loading gauge of the trams on this route. The north-east portal of Tunnel No. 11. 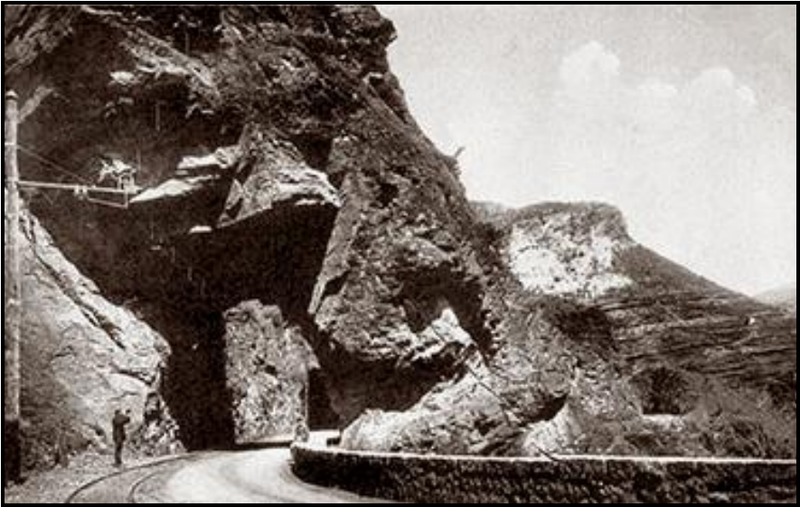 Immediately after leaving the 57 metre-long tunnel the road/tramway needed the support of a substantial retaining wall. Tunnel No. 12 is just 16 metres long. South portal of Tunnel No. 12. North portal of Tunnel No. 12. 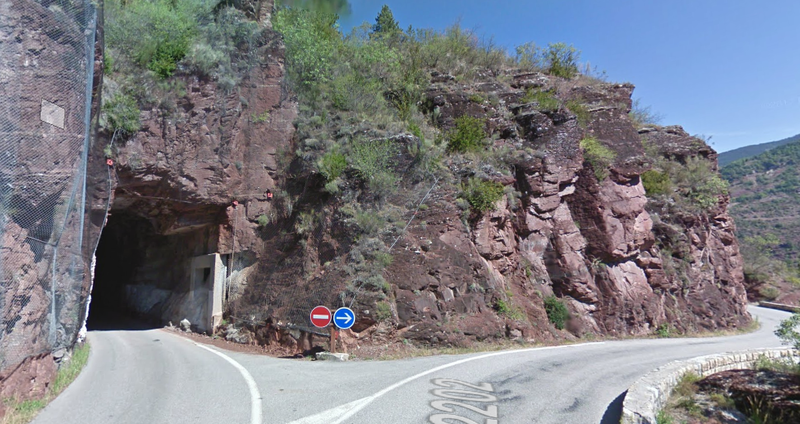 Turning 180 degrees from the location of the last photo … the south portal of Tunnel No. 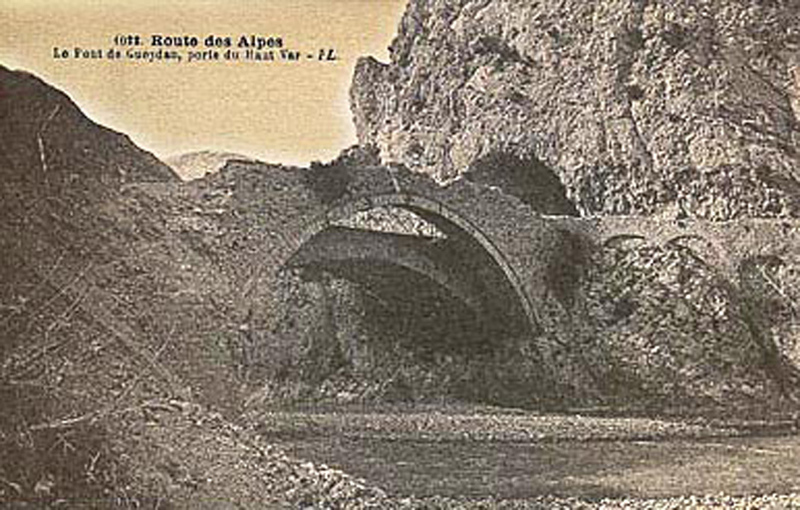 13 and the bridge over a gully immediately before the tunnel. 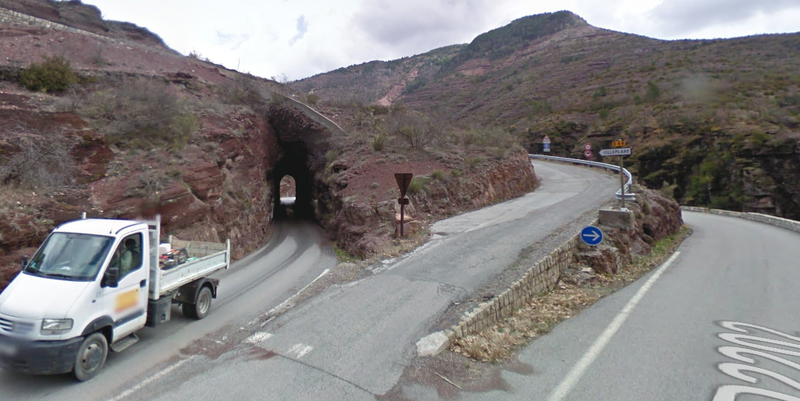 A panoramic view from above Tunnel No. 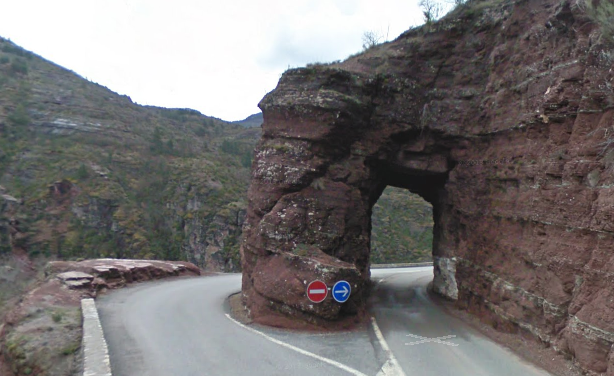 12 of the road approaching the dramatic bridge, Le Pont de la Mariée. 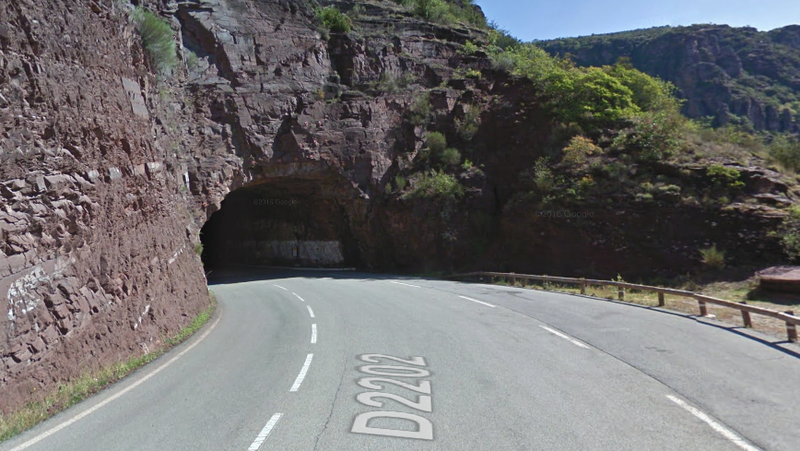 The 2CV is on the road adjacent to Tunnel No. 13. The north portal of Tunnel No. 13. 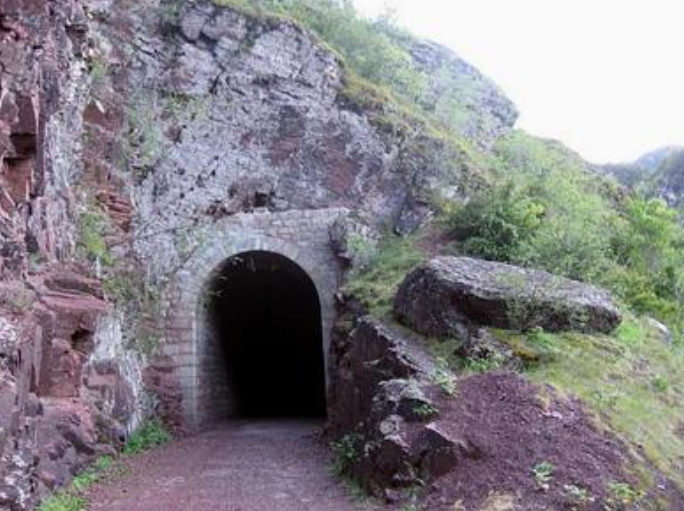 The south portals of Tunnels Nos. 14 and 15. 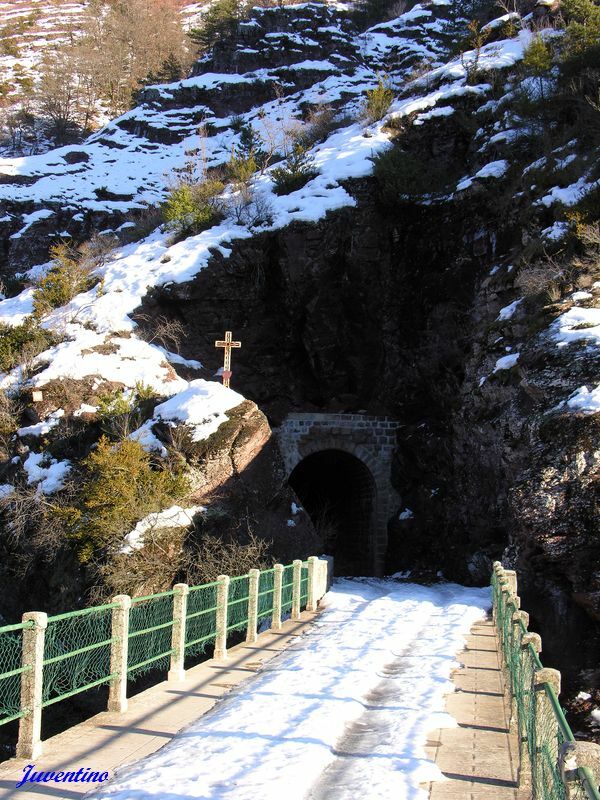 The south portal of Tunnel No. 15. The north portal of Tunnel No. 14. The north portal of Tunnel No. 15. 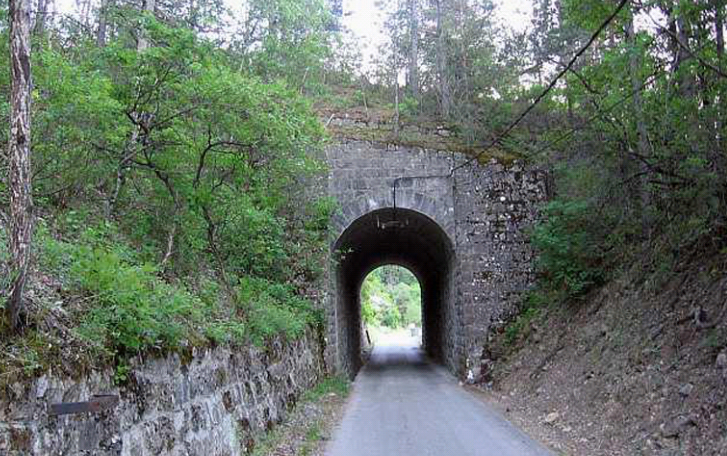 The southwest portal of Tunnel No. 16, which reveals further tunnels beyond! The northeast portal of Tunnel No. 16. 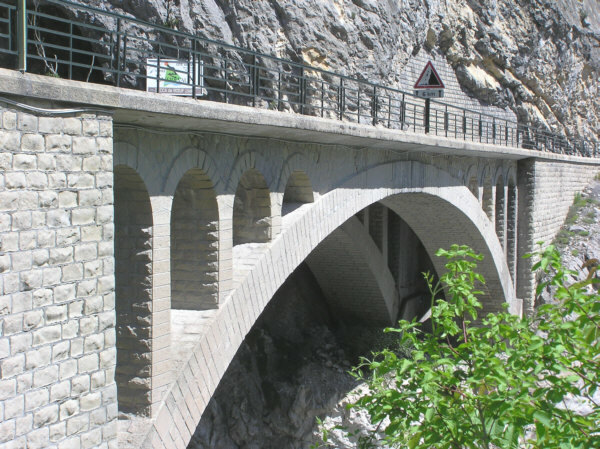 Le Pont de la Mariée was built in the clearly part of the 20th Century. 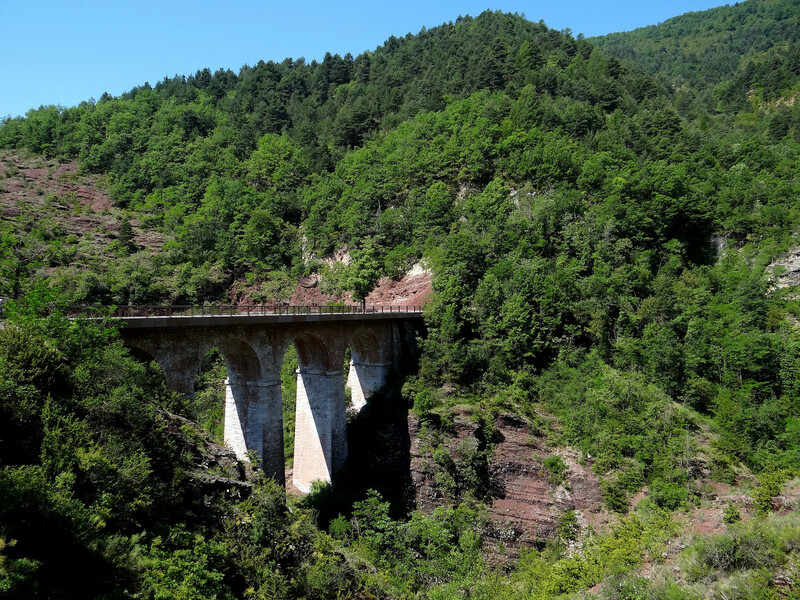 It has a 62 metre span and sits 80 metres above the valley floor. 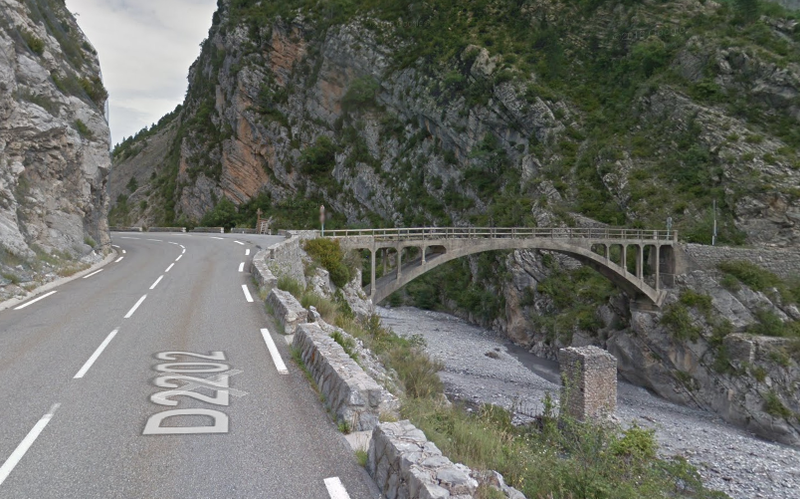 It is salutary to think that this bridge only saw active use for a period of 6 years in the 1920s. So much work for so little gain! The image below was taken during its construction. 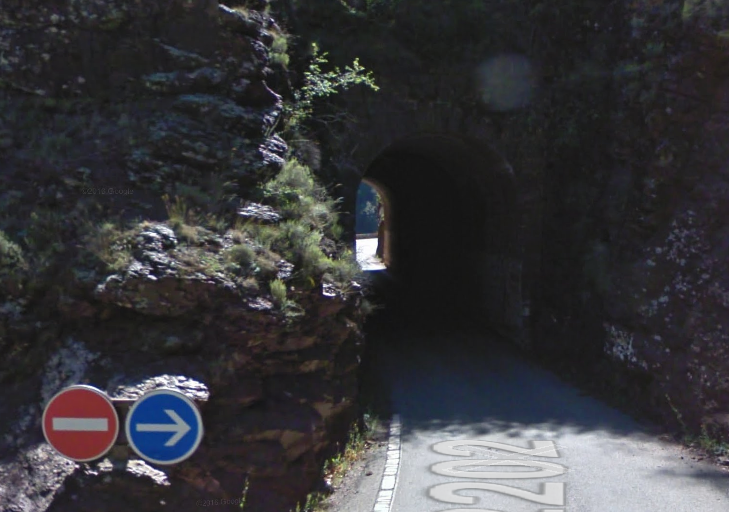 The next tunnel, Tunnel No. 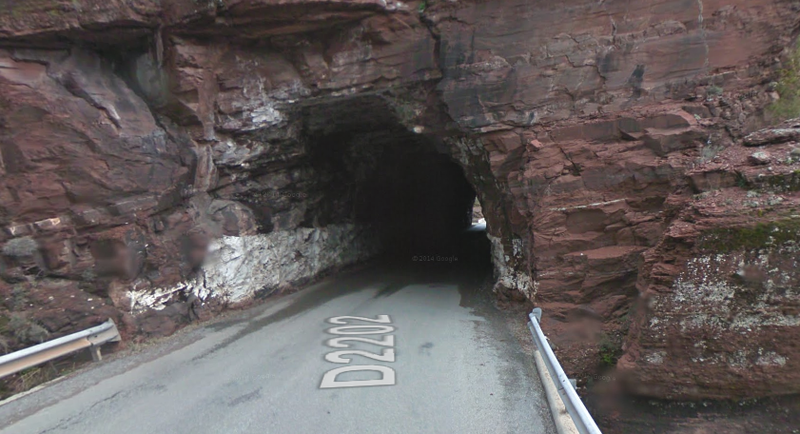 18, is the first of these tunnels on the east side of the River Var. Tunnel No. 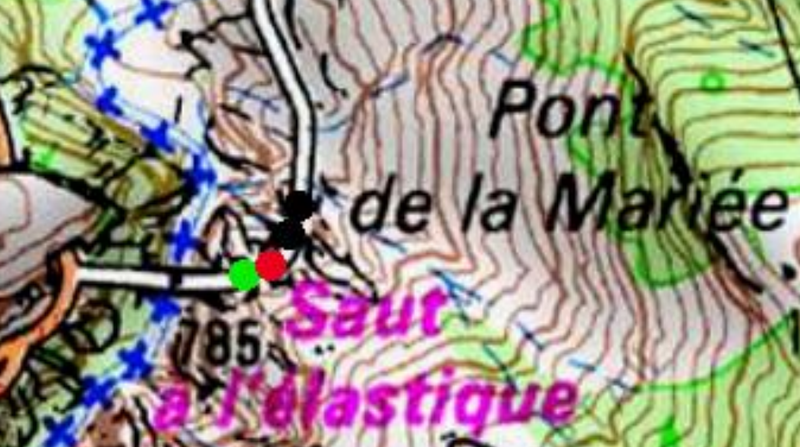 18 is marked on the plan above by the green and red dots. It is 42 metres long and was built specifically for the tramway. Access in the 21st Century is restricted to pedestrians. 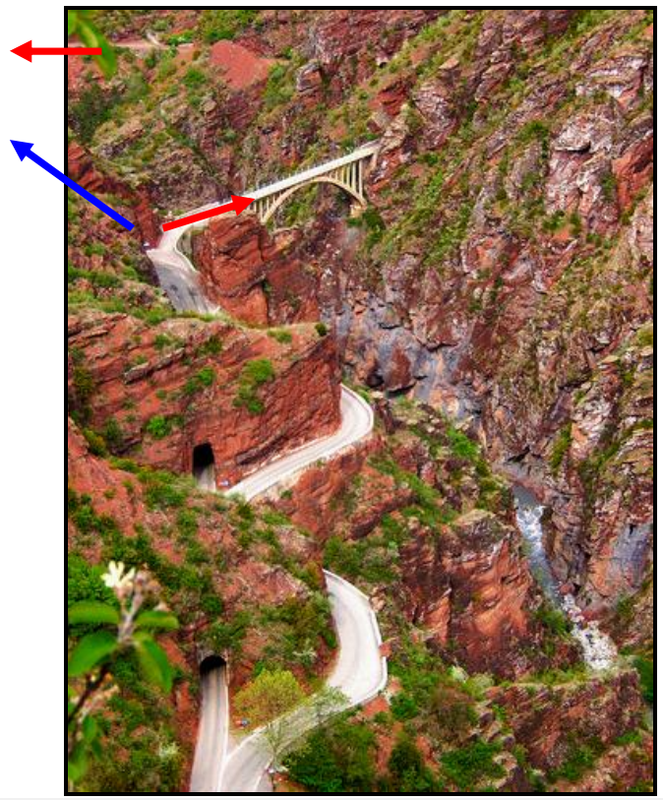 Its west postal is shown immediately below and its east portal on the second image below. Tunnel No. 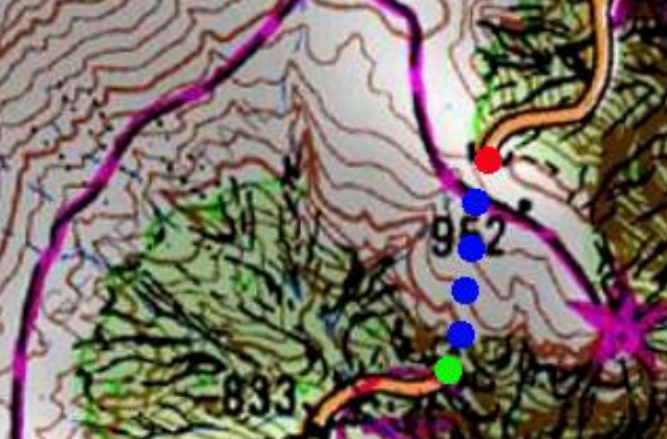 19 is shown by the two black dots on the above map. It is just 28 metres long and also only accessible on foot. 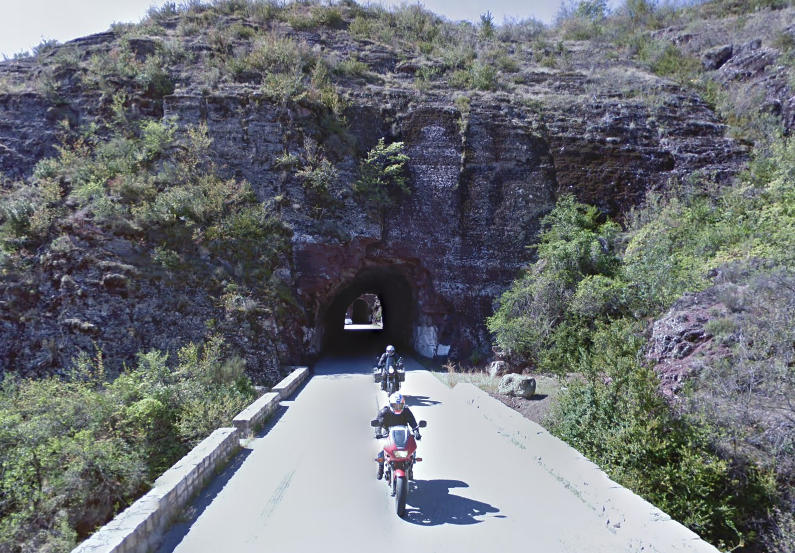 The West portal of Tunnel No. 18. The East portal of Tunnel No. 18. Tunnel No. 19: south portal (left above) and north portal (right above). 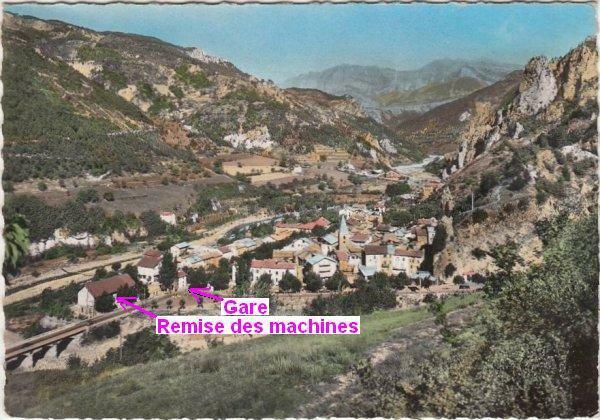 The satellite image above shows the bridge and the tramway route passing through the rock in Tunnels Now 18 and 19 before heading north until quite close to the River Var. 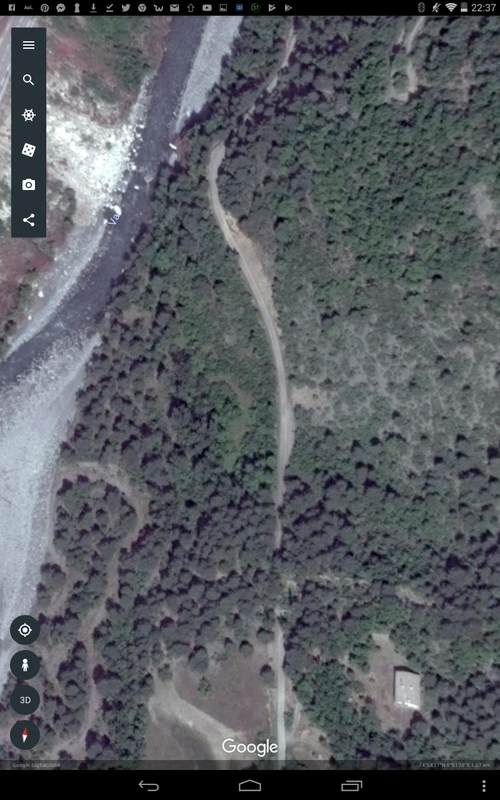 The image immediately below picks up the line of the tramway travelling further north through a heavily wooded area, and the one below that shows the tramway formation leaving the wodds and passing a campsite. The old tramway has now become an access road for the campsite. 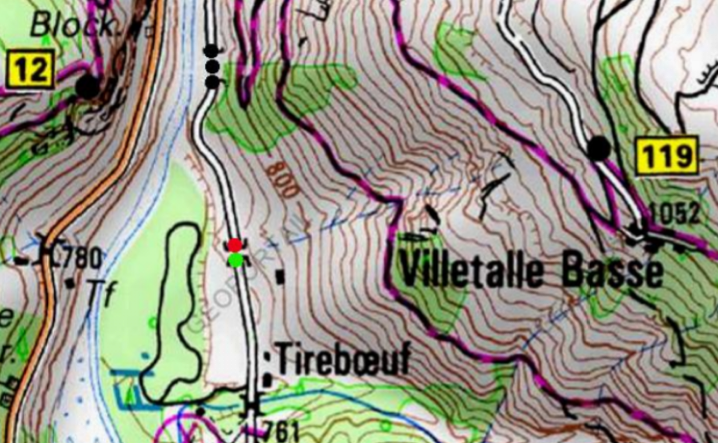 The tramway formation crosses the Vallon de Tireboeuf and continues north as shown on the map below. 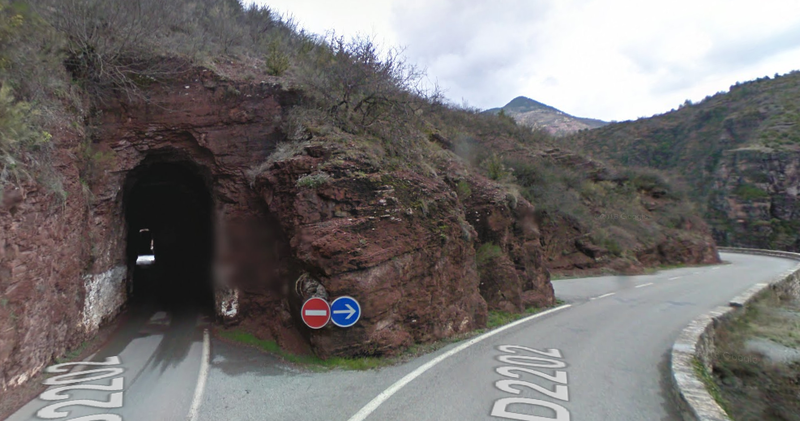 Two tunnels were encountered on this part of the journey – Tunnels Nos. 20 and 21. Tunnel No. 20 is marked by the green and red dots on the plan. Tunnel No. 21 is marked by the black dots. Tunnel No. 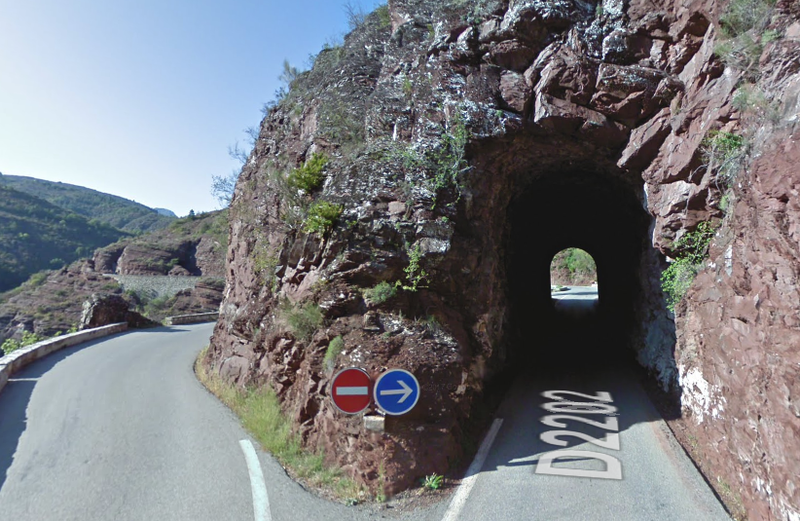 20 is also known as Tunnel de Ruine. It is no more than 20 metres long. 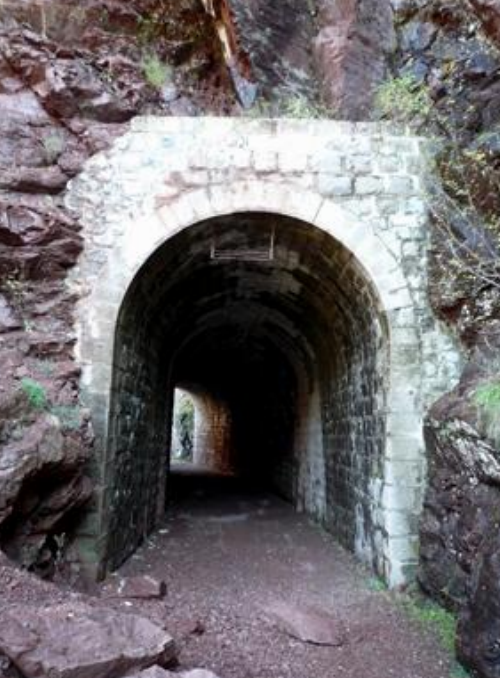 The picture below shows it north portal. Tunnel No. 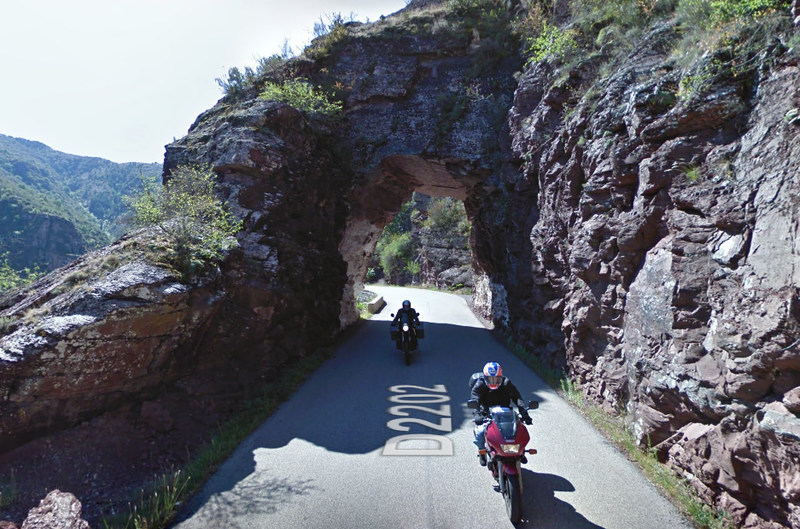 21 is in fact a 4i metre-long protective gallery over the line which the images below show clearly. 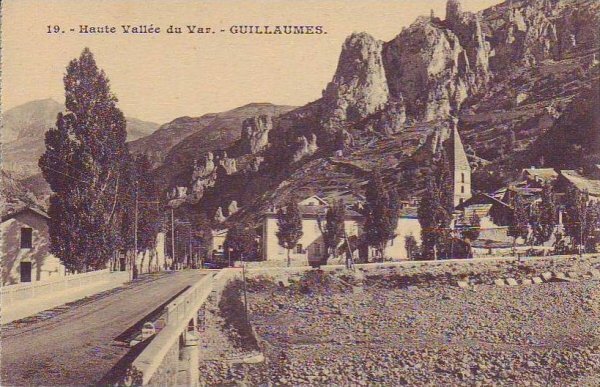 The tramway ran north from the gallery towards Guillaumes on the east side of the River Var. In the adjacent satllite image the gallery can be seen close to the bottom of the picture. 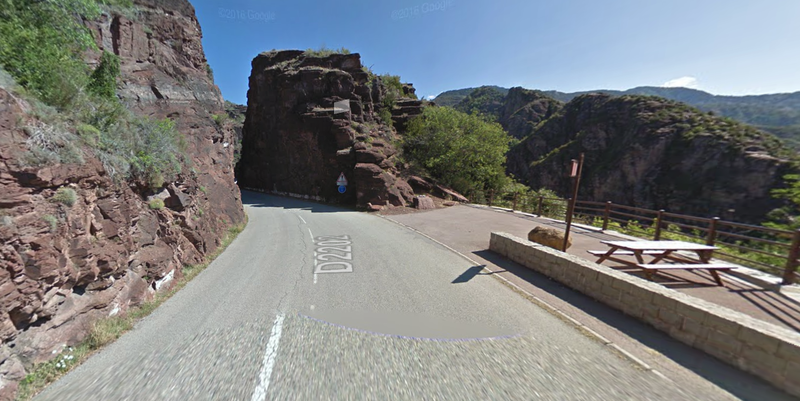 The point at which the road crosses the river to rejoin the tramway alignment can be seen close to the top of the picture. The modern road bridge seems to dominate the location , but the old road bridge can be picked out immediately to the north of the modern bridge. 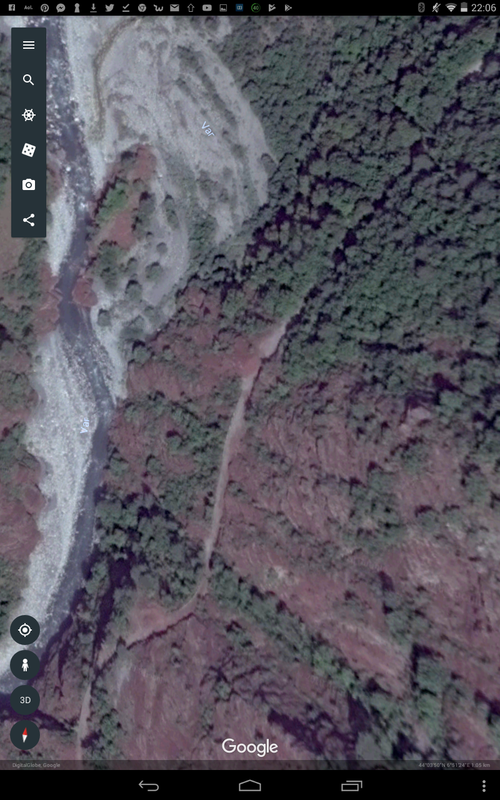 The location is shown in the images below. 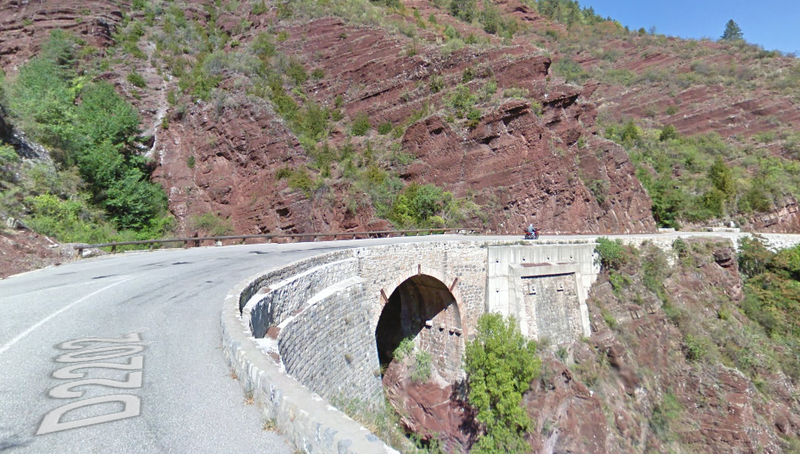 The first picture shows the modern road bridge and alongside it the original road bridge built in the mid-1800s. The picture is taken looking towards Daluis, downstream of the location. 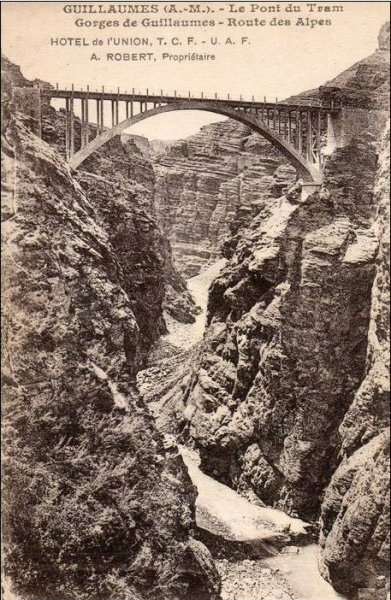 The second image below shows the the modern bridge and, on the east bank of the river the tramway formation under high cliffs. This picture is taken looking upstream towards Guillaumes. http://marc-andre-dubout.org/cf/baguenaude/daluis/daluis.htm, accessed on 22nd July 2018. 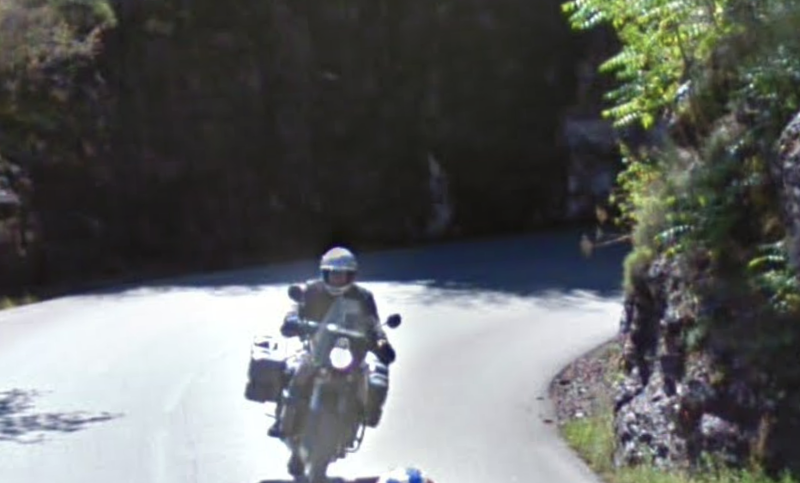 Rainer Eisenschmid; Provence, Côte d’Azur. Baedeker, 2011. p. 266. Reinhard Scholl; Französische Seealpen: Alpes-Maritimes: Mercantour – Merveilles; 50 ausgewählte Berg- und Talwanderungen (in German). Bergverlag Rother, 2002. pp. 48–55. Dana Facaros, Michael Pauls; Provence. New Holland, 2004. p. 254. M. Victor de Cessole; “En Hiver: Ascensions dans les Alpes Maritimes”. Annuaire (in French). 24. 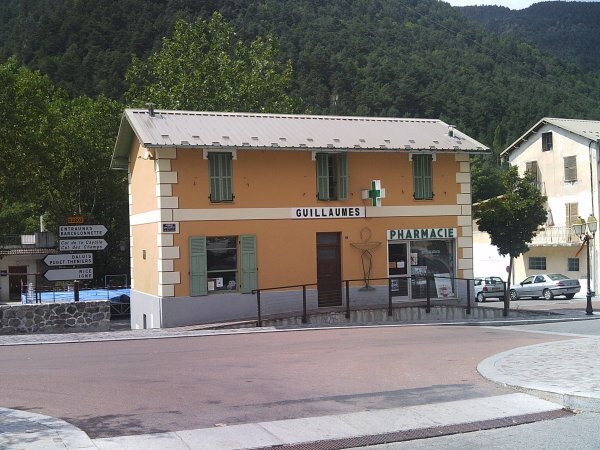 Club Alpin Français, 1898. pp. 157–72. 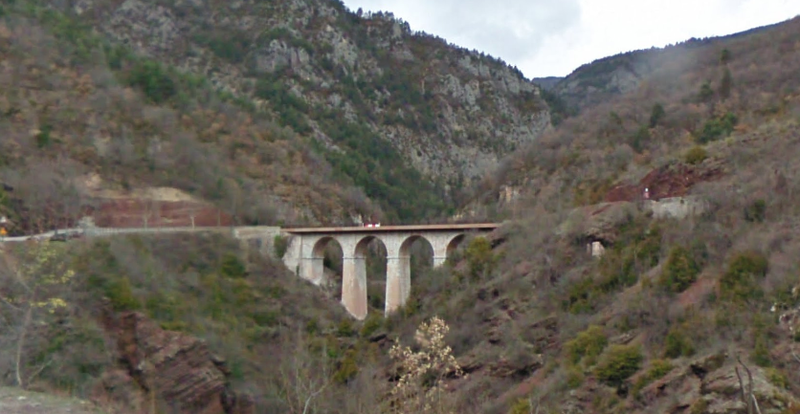 https://en.wikipedia.org/wiki/Gorges_de_Daluis, accessed on 22nd July 2018.
https://structurae.net/structures/pont-de-gueydan, accessed on 22nd July 2018.
http://www.inventaires-ferroviaires.fr/hd04/04174.a.pdf, accessed on 22nd July 2018.
https://www.camptocamp.org/waypoints/439483/fr/pont-de-bertheou, accessed on 22nd July 2018.
https://www.guillaumes.fr/la-mineralogie and http://paca.lpo.fr/images/mediatheque/fichiers/section_protection/espaces/reserve_naturelle_regionale_des_gorges_de_daluis/documentation/depliant_presentation_rnr_daluis.pdf, accessed on 23rd July 2018.
https://www.guillaumes.fr/le-circuit-cyansdaluisle-circuit-cyansdaluis, accessed on 23rd July 2018.
http://www.tunnels-ferroviaires.org/tu06/06071.1.pdf, accessed on 23rd July 2018.
http://www.tunnels-ferroviaires.org/tu06/06071.2.pdf, accessed on 23rd July 2018.
http://www.tunnels-ferroviaires.org/tu06/06071.3.pdf, accessed on 23rd July 2018.
http://www.tunnels-ferroviaires.org/tu06/06071.4.pdf, accessed on 23rd July 2018.
http://www.tunnels-ferroviaires.org/tu06/06071.5.pdf, accessed on 23rd July 2018.
http://www.tunnels-ferroviaires.org/tu06/06071.8.pdf, accessed on 23rd July 2018.
http://club.caradisiac.com/interceptor-s4/cartes-postales-81352/photo/gorges-daluis-2cv-5554845.html#photo_5554845, accessed on 24th July 2018.
http://www.tunnels-ferroviaires.org/tu06/06071.16.pdf, accessed on 24th July 2018.
http://www.tunnels-ferroviaires.org/tu06/06000.1.pdf, accessed on 24th July 2018.
http://www.par-monts-et-par-vaux.eu/ponts_alpes-maritimes_1.html#Pont_Mari%C3%A9e_Guillaumes, accessed on 24th July 2018.
http://www.tunnels-ferroviaires.org/tu06/06071.18.pdf, accessed on 24th July 2018.
http://www.tunnels-ferroviaires.org/tu06/06071.20.pdf, accessed on 25th July 2018.
http://www.tunnels-ferroviaires.org/tu06/06071.21.pdf, accessed on 25th July 2018.
http://dan-randos-photos.monsite-orange.fr/page-592d18d4a3c5a.html, accessed on 25th July 2018.
http://draillescantoun.canalblog.com/archives/2009/05/11/13841773.html, accessed on 25th July 2018. This entry was posted in Railways and Tramways Around Nice, Railways Blog on July 25, 2018 by rogerfarnworth.